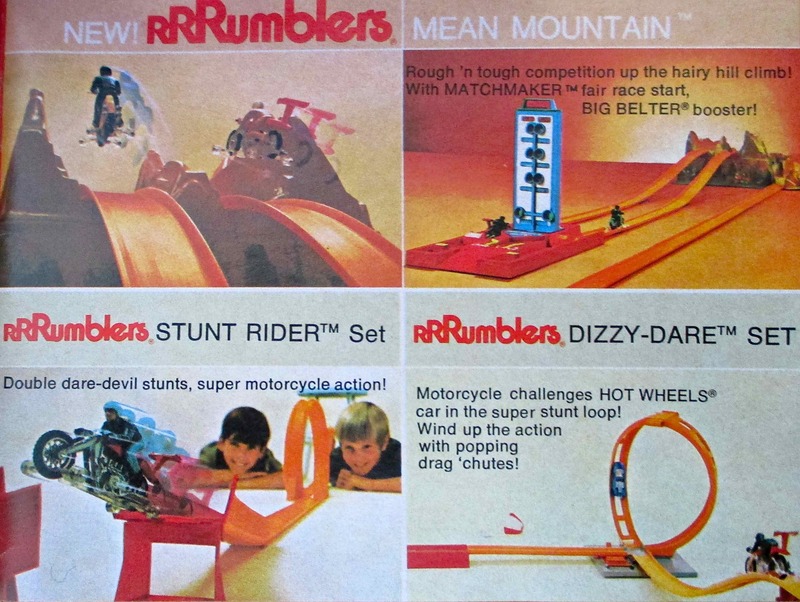 Part 3 of the 1971 Hot Wheels RRRumblers Mean Mountain. Time to go racing! 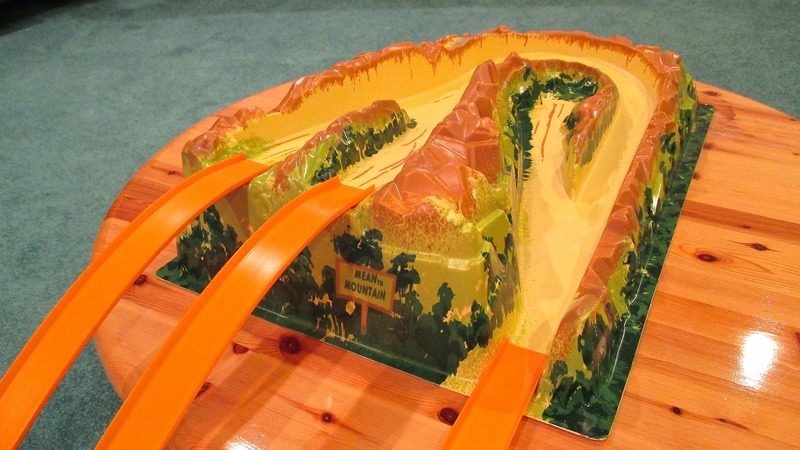 This set comes with 24 feet of orange track, 10 joiners, 1 Big Belter, 1 Matchmaker and 1 Mean Mountain. 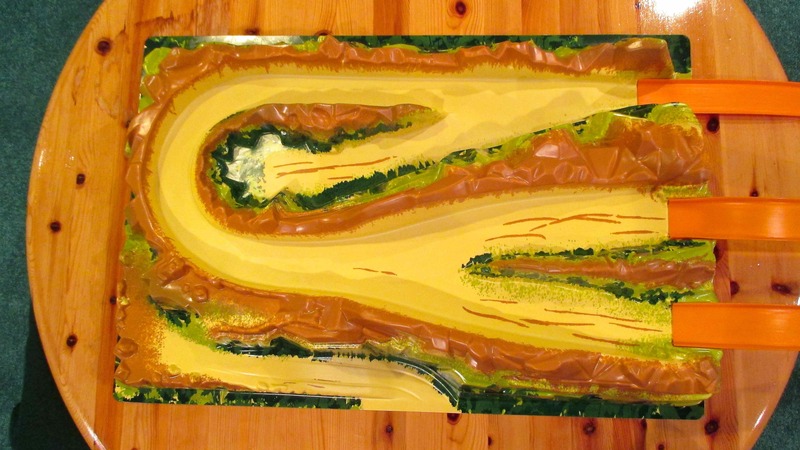 Here’s a run through the mountain course. On the Big Belter start. Charging out of the Big Belter and down the track. Round the corner. 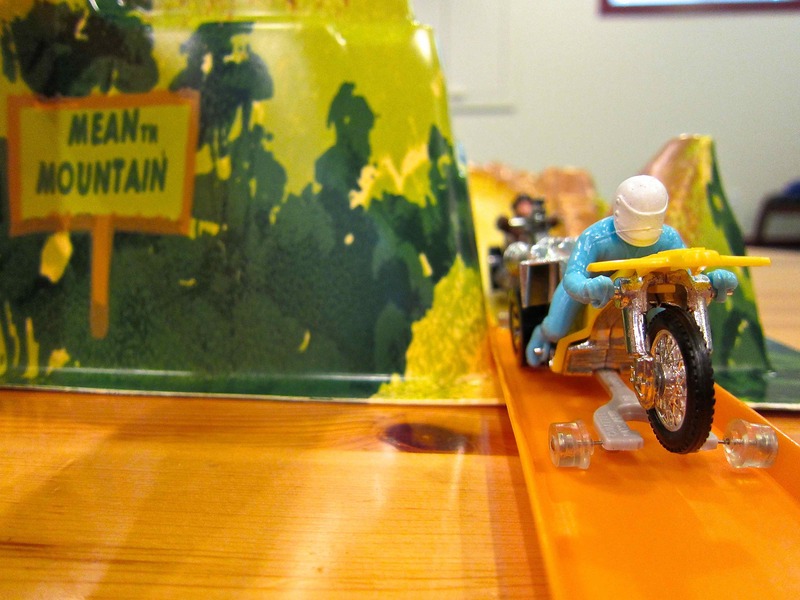 The yellow 1972 Roamin’ Candle has this race! Heading out of the Mean Mountain. End of the line. Back to the starting area. 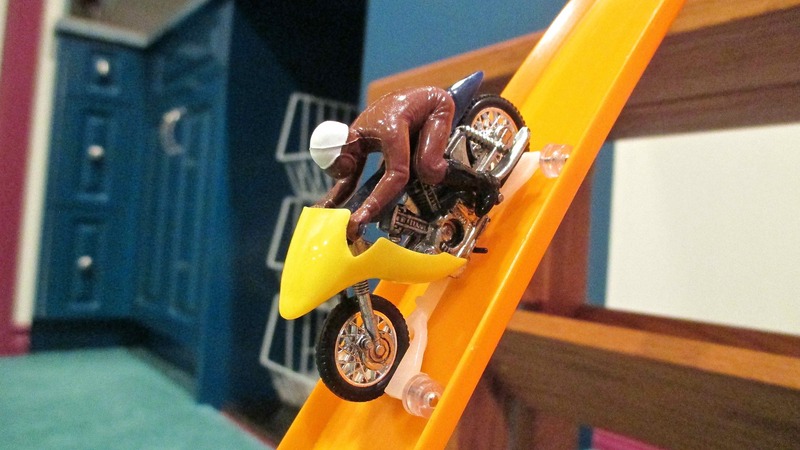 Take a look at the video of a 4 bike set racing the Mean Mountain. So there you have it. 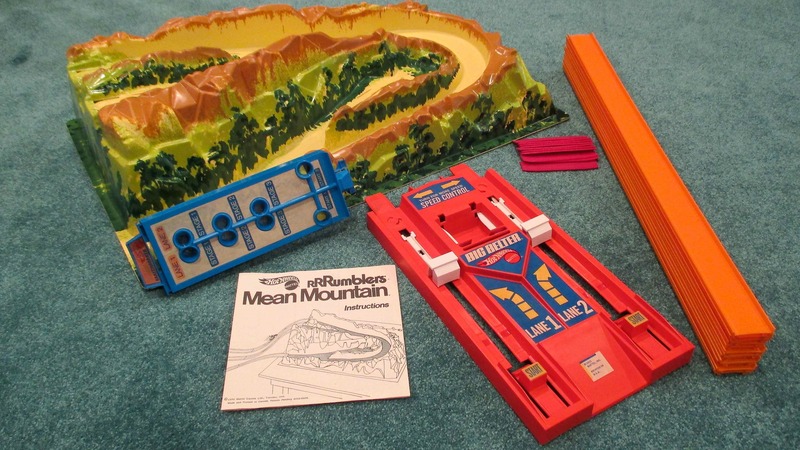 The 1971 Hot Wheels RRRumblers Mean Mountain. 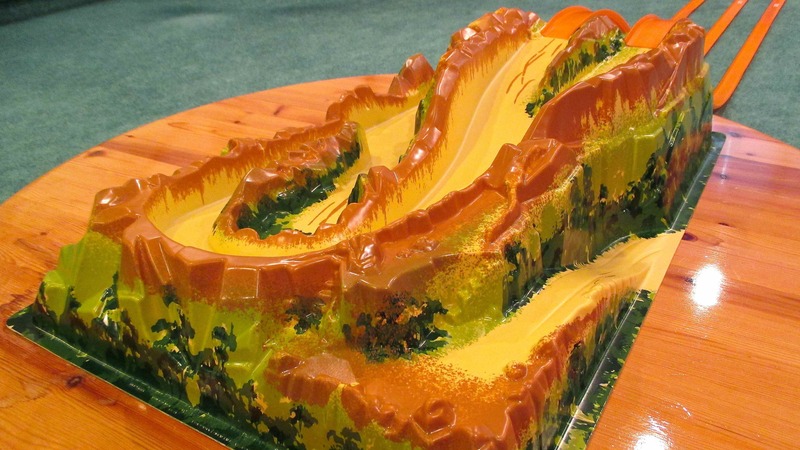 The Mean Mountain is easy to assemble. 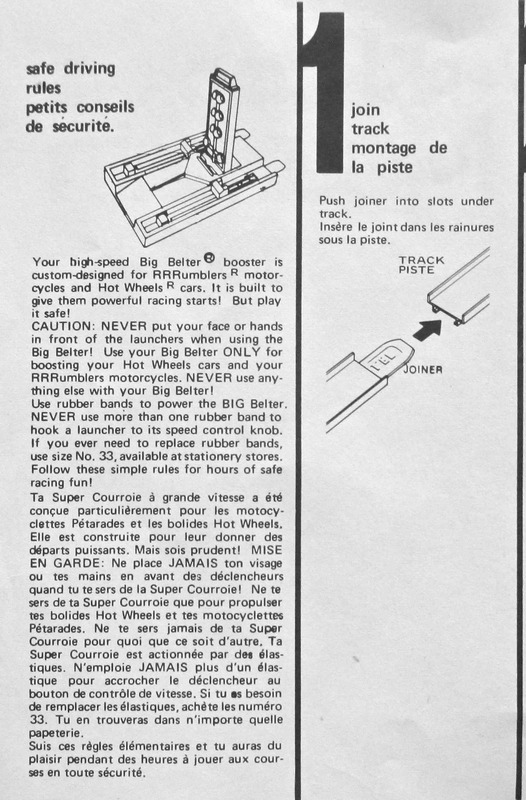 Here are the instructions that come with the Canadian version of this set (french and english wording). Click on any image to see a larger version. 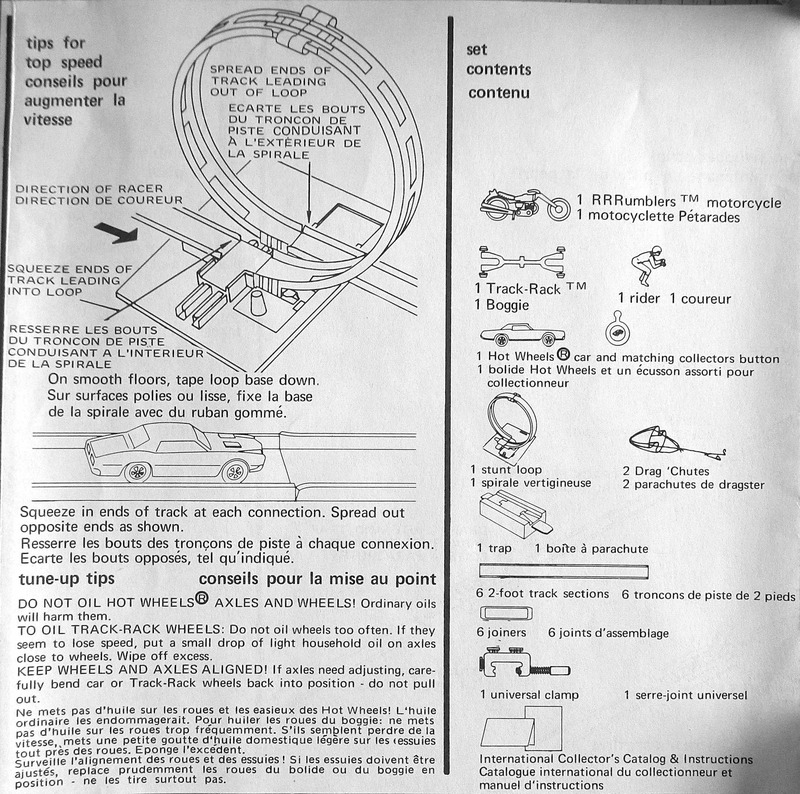 Instructions – front page. 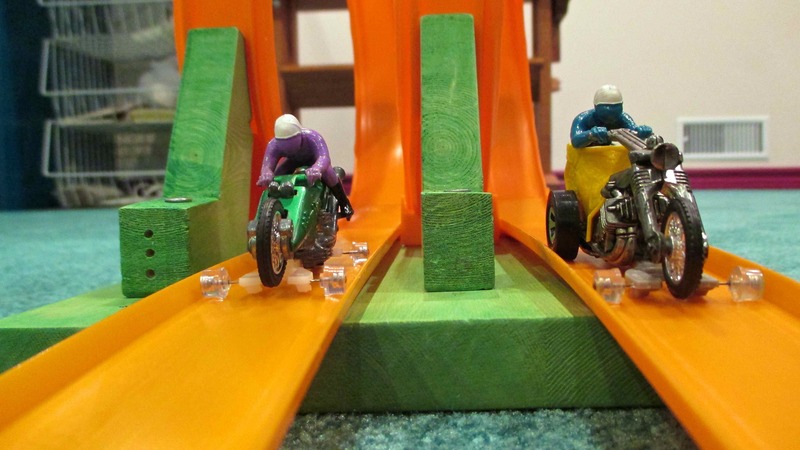 Copyright Mattel, Inc. The complete setup. 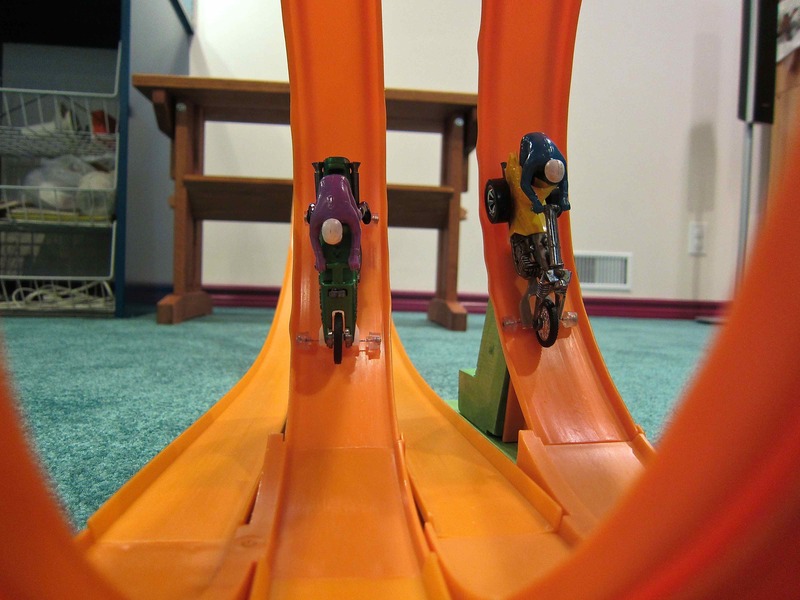 Copyright Mattel, Inc. Safe driving rules & Step 1. 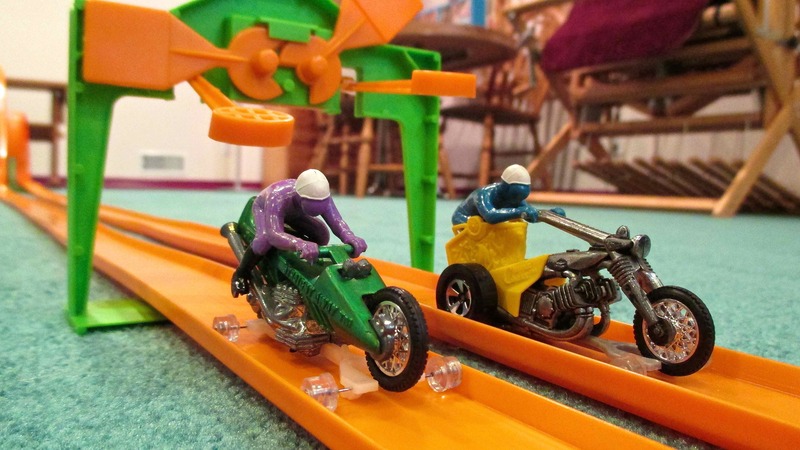 Copyright Mattel, Inc. Step 2. 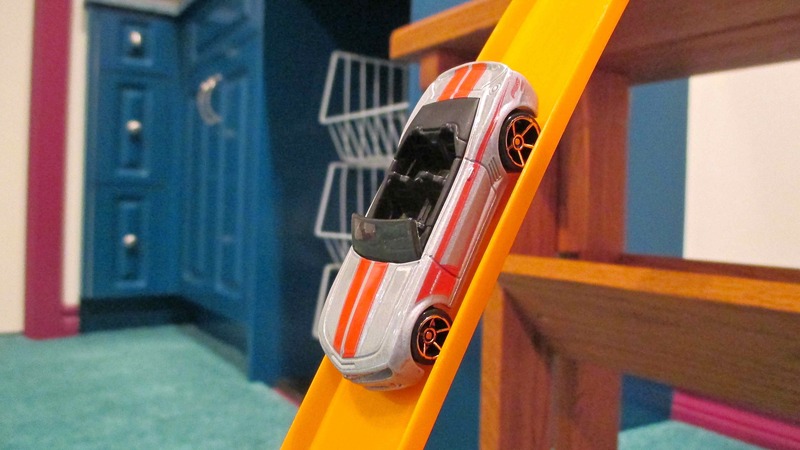 Copyright Mattel, Inc.
Steps 3 & 4. 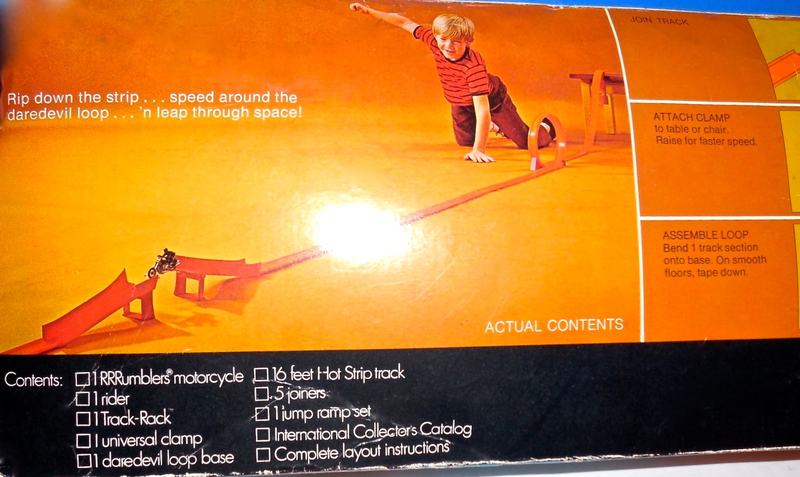 Copyright Mattel, Inc.
Steps 5 & 6. Copyright Mattel, Inc. Step 7. Copyright Mattel, Inc. 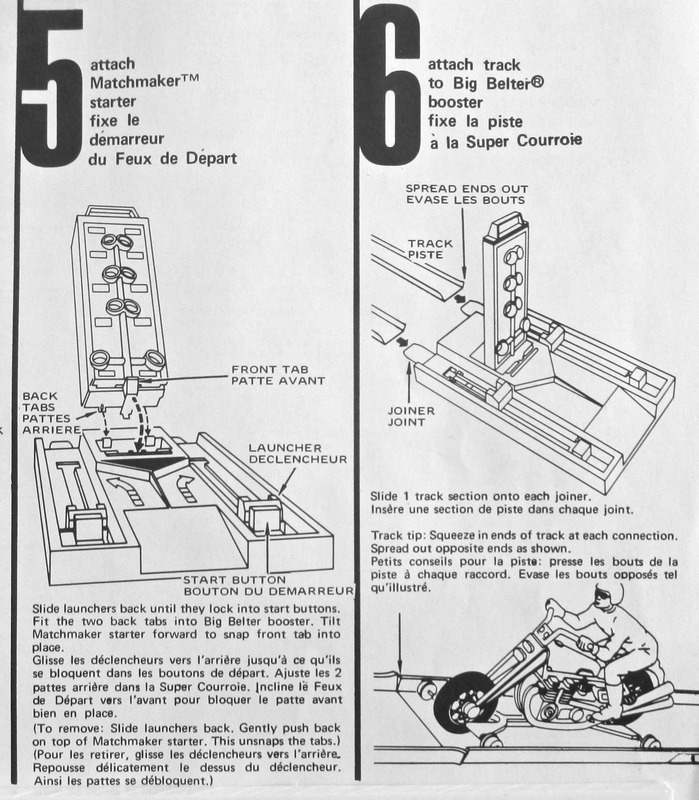 Step 8 and set contents. 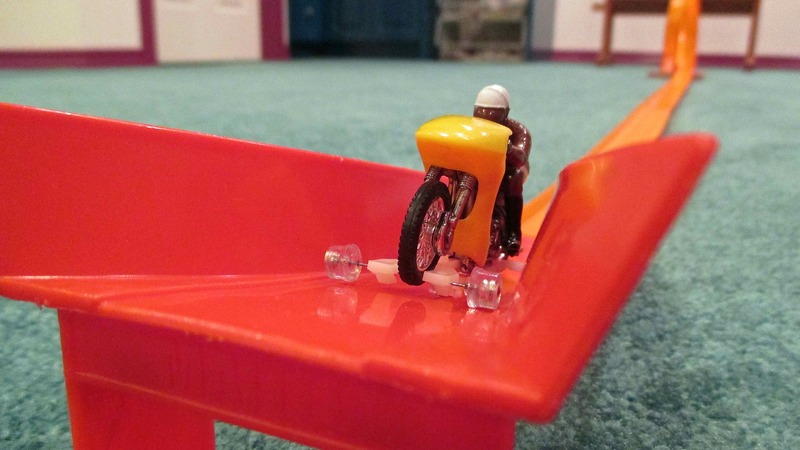 Copyright Mattel, Inc. So there you have it. 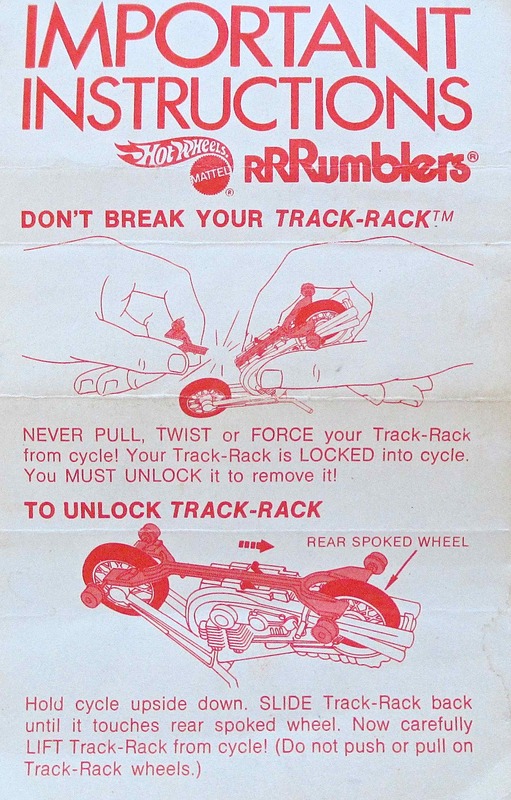 The how-to part of the 1971 Hot Wheels RRRumblers Mean Mountain. 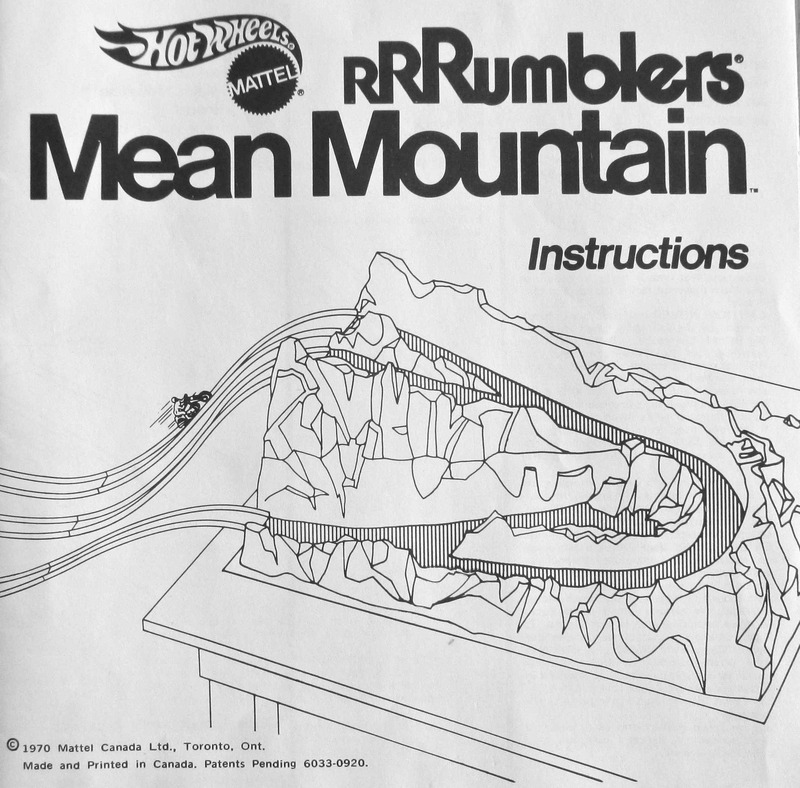 The big RRRumblers set for 1971 is the Mean Mountain. 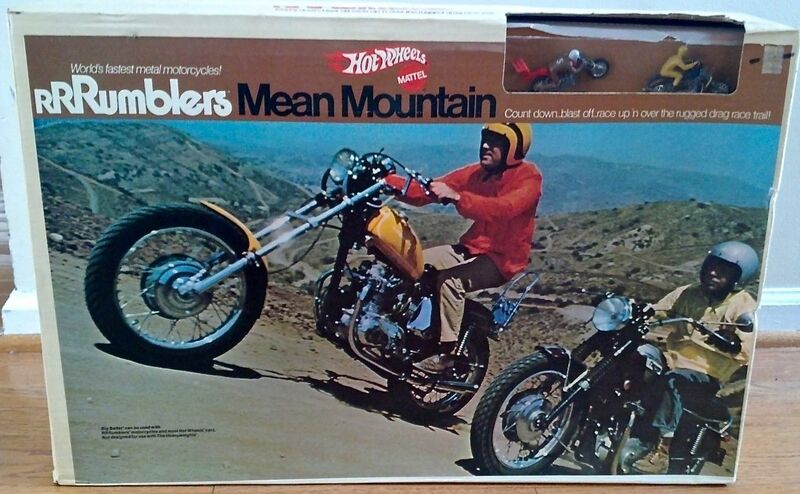 The picture on the box is a classic image of motorcycle hill climbing in Southern California during the early ’70s. 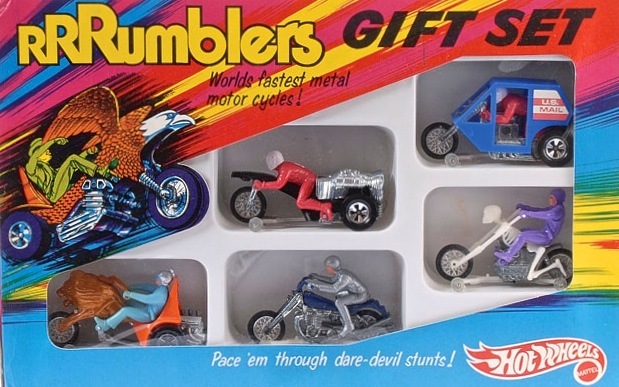 US set with box window revealing the 2 contained motorcycles. Courtesy eBay. Canadian set has no vehicle window. 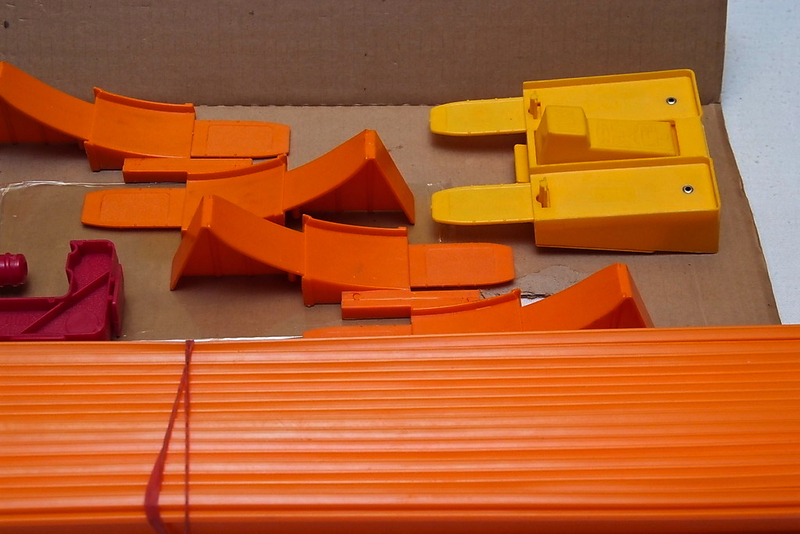 This set includes 24 feet of orange track, 10 joiners, 1 Big Belter & Matchmaker, and 1 Mean Mountain. 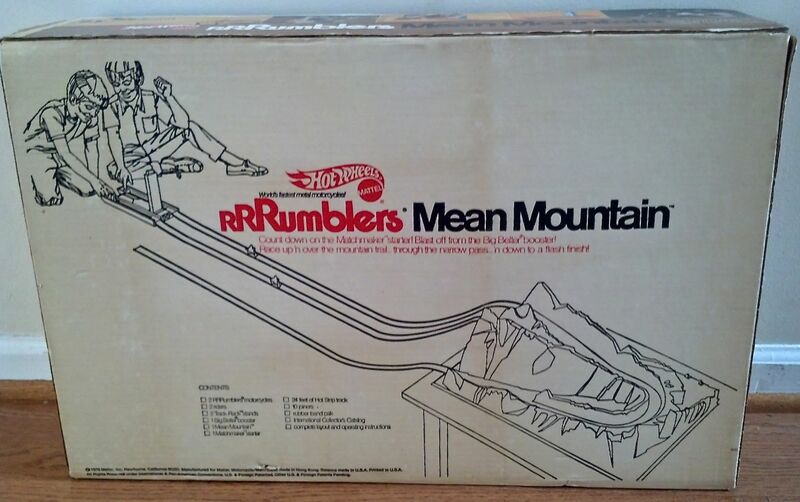 The box art on the back shows that you can make the hill climb as high as you want depending on the table you are using. Box art – back. US version. Courtesy eBay. Box art – back. Canadian version. 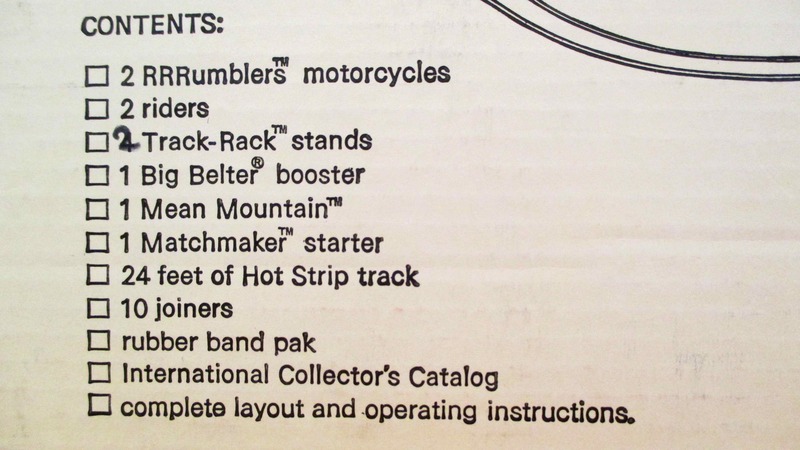 Contents list on back of box. Box art – side. 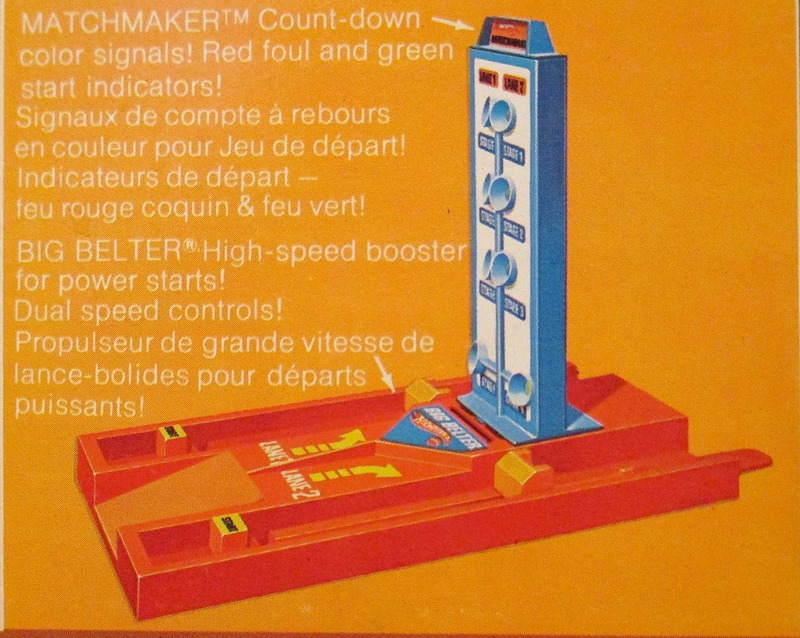 Canadian version in French. 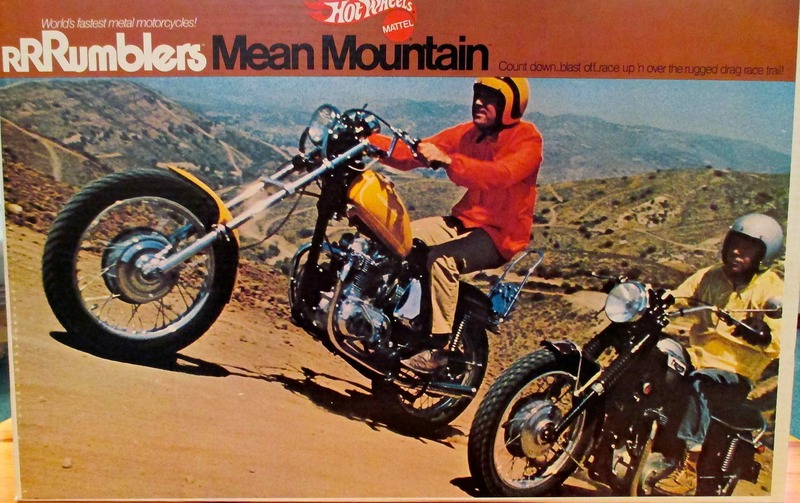 Box art – side in color. Box art – side. Close-up. Box art – side. Motorcycle list. 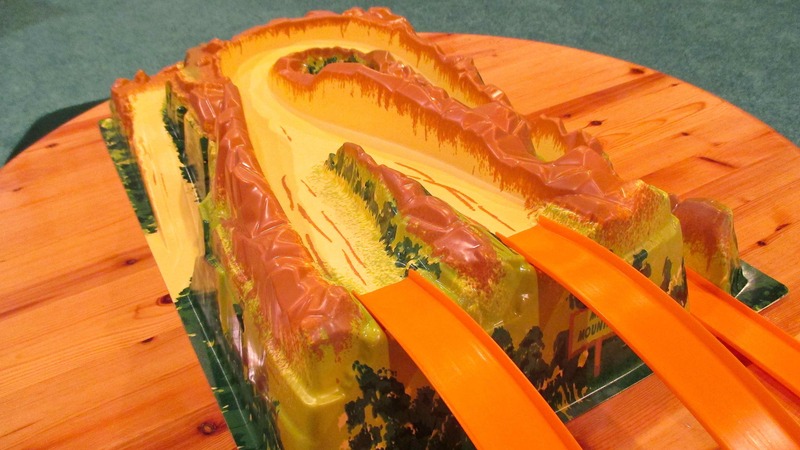 Out of the box, this is the Mean Mountain. 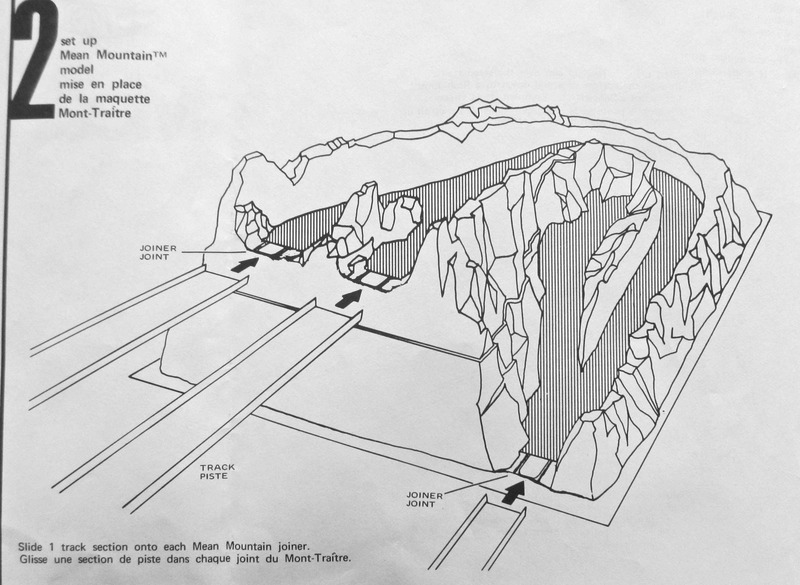 And here’s an introduction video about the Mean Mountain. So there you have it. 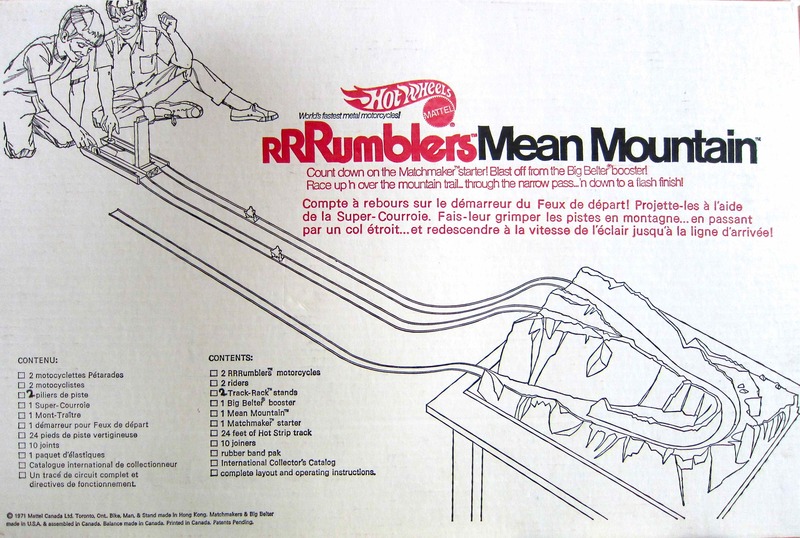 The 1971 Hot Wheels RRRumblers Mean Mountain. Part 1 – an introduction. 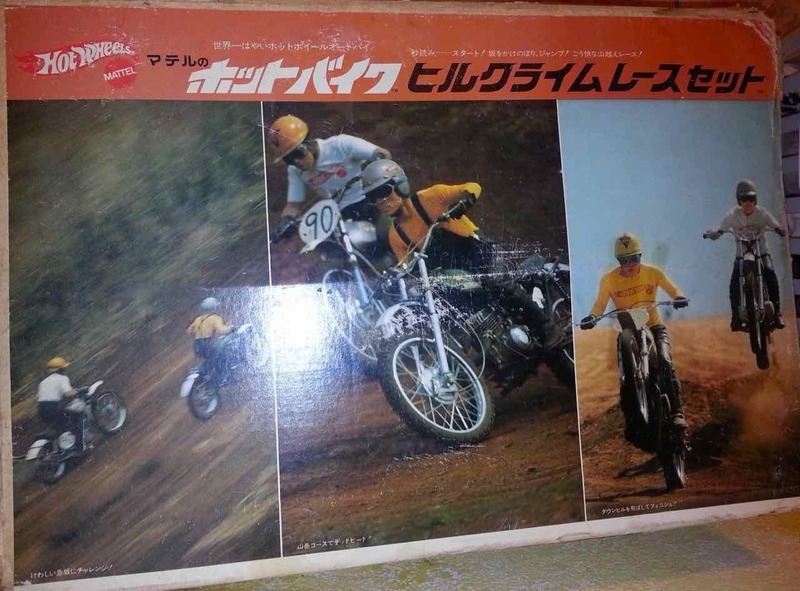 Mean Mountain box from Japan – front. Courtesy eBay. Mean Mountain box from Japan – back. Courtesy eBay. 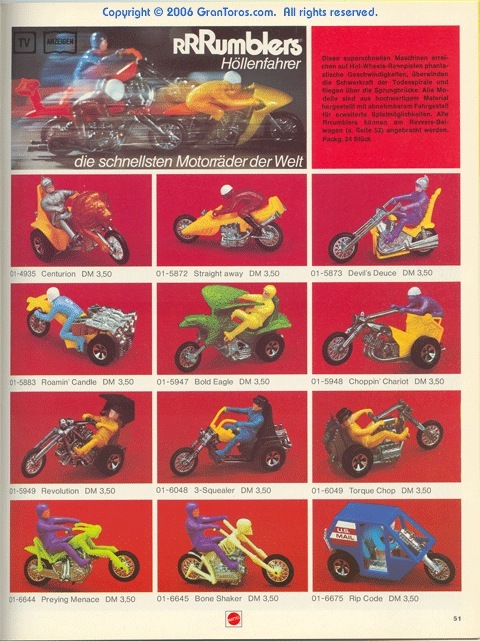 1971 Japanese Collectors’ Catalogue. Courtesy eBay. 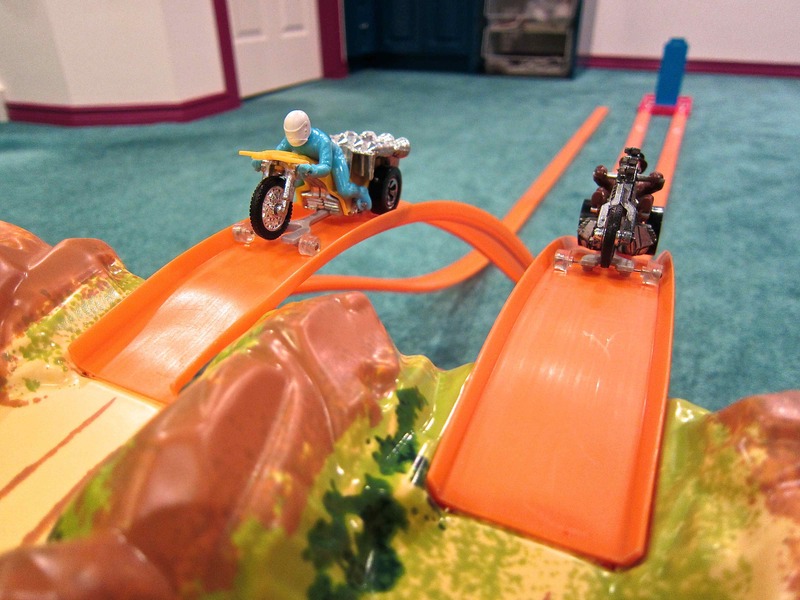 The 1971 Hot Wheels RRRumblers Dizzy-Dare Set features a RRRumblers motorcycle going up against a Hot Wheels car on a single-lane loop track with drag ‘chute finish. Box art – front. Canadian version. 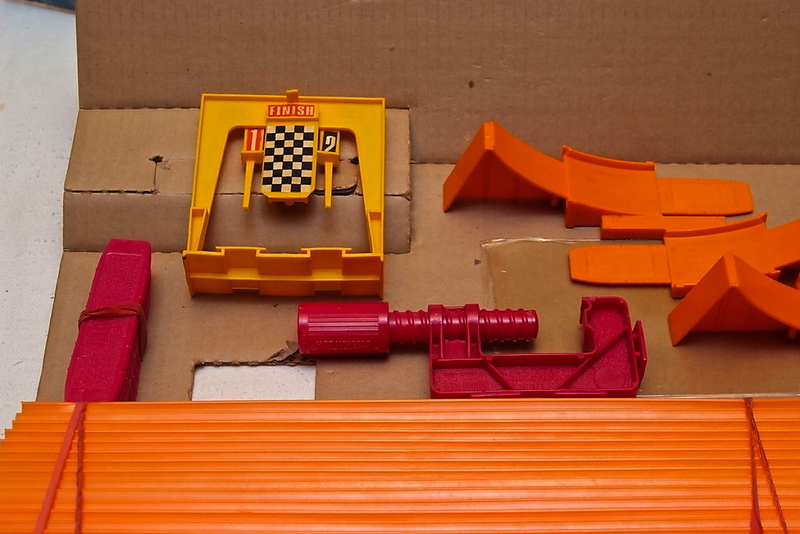 The set comes with 14 feet of orange track, 6 joiners, 1 universal clamp, 1 stunt loop, 1 ‘chute trap and 2 drag ‘chutes. 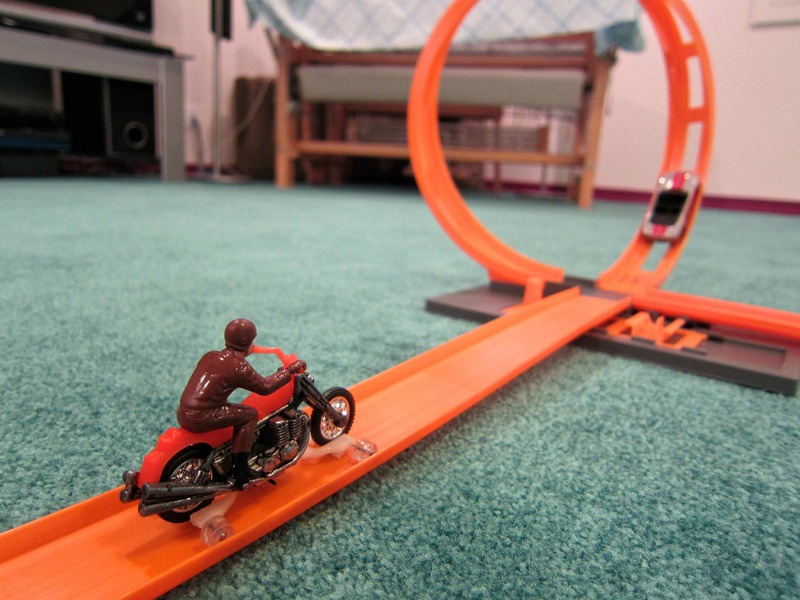 The stunt loop can be configured into a standard 360 degree circle (The Swooper Loop) with the vehicles traveling in a straight line or it can be twisted into an oblong circle (The Big-Twist Loop) with the vehicles exiting at a 90 degree angle from their entrance. 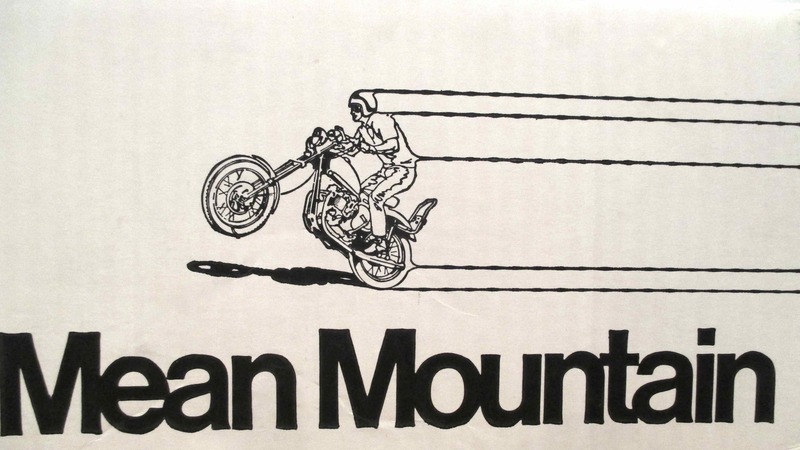 Box art – back. 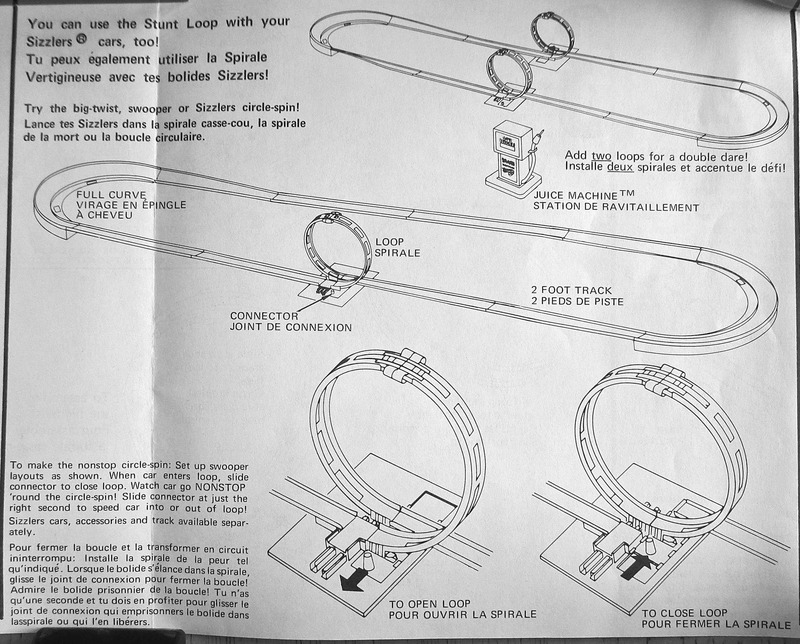 Showing the 2 loop configurations. Instructions – steps 1 & 2. Copyright Mattel, Inc. Instructions – step 3. 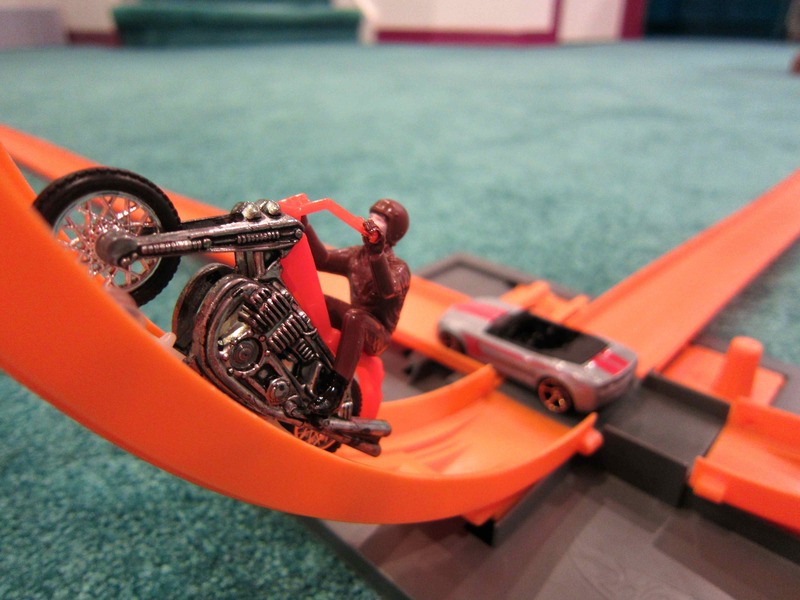 Copyright Mattel, Inc. 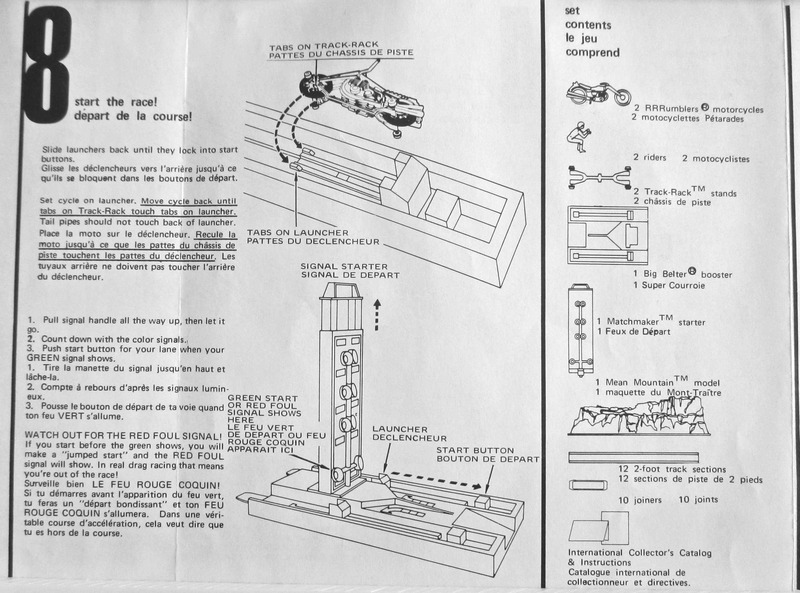 Instructions – step 4. 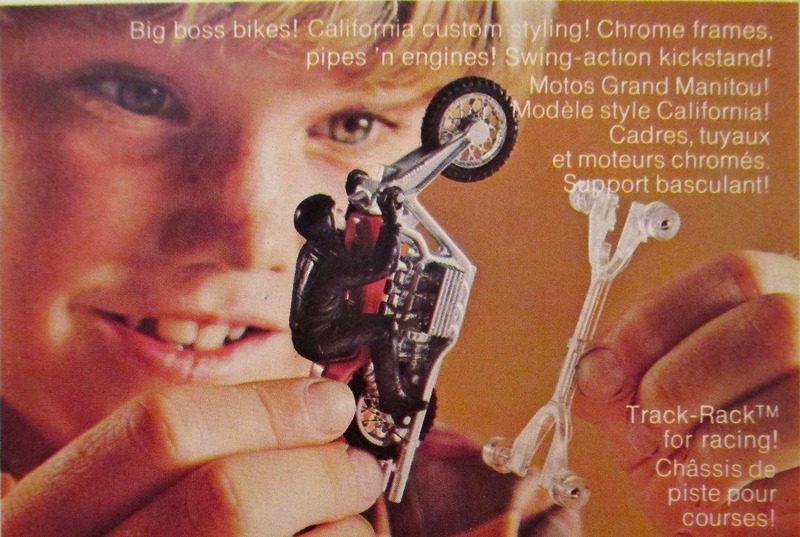 Copyright Mattel, Inc. 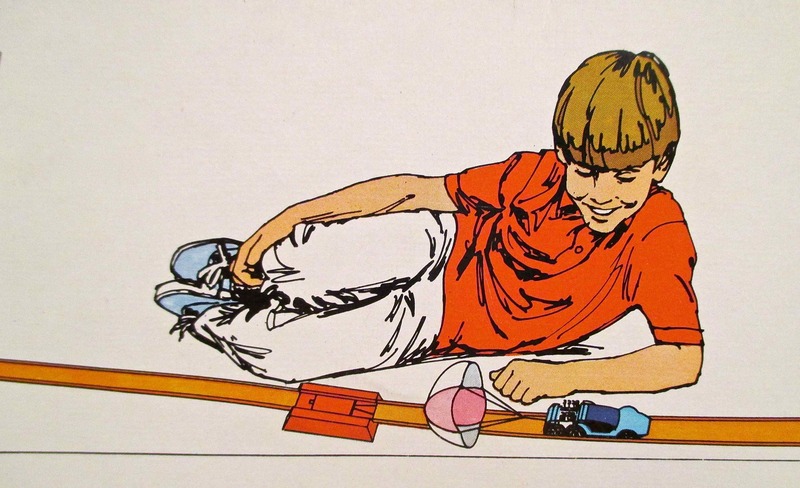 Instructions – step 5. 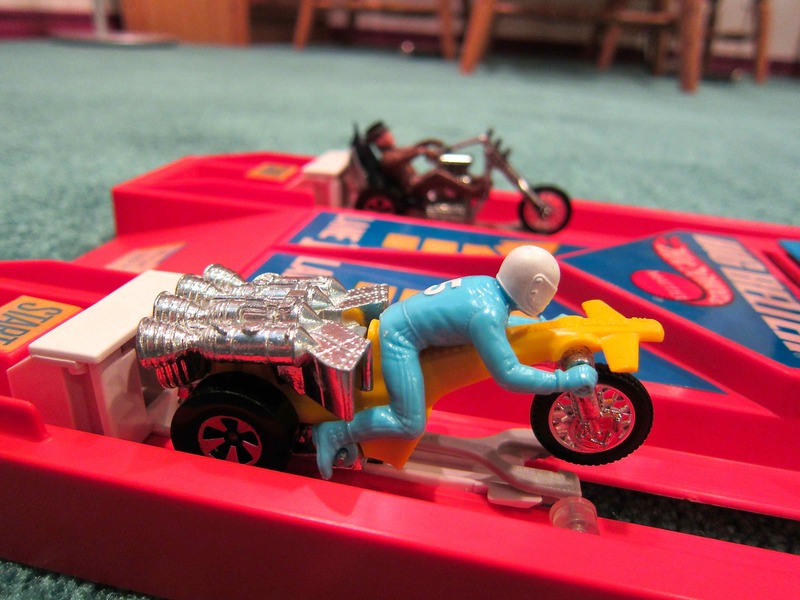 Copyright Mattel, Inc. 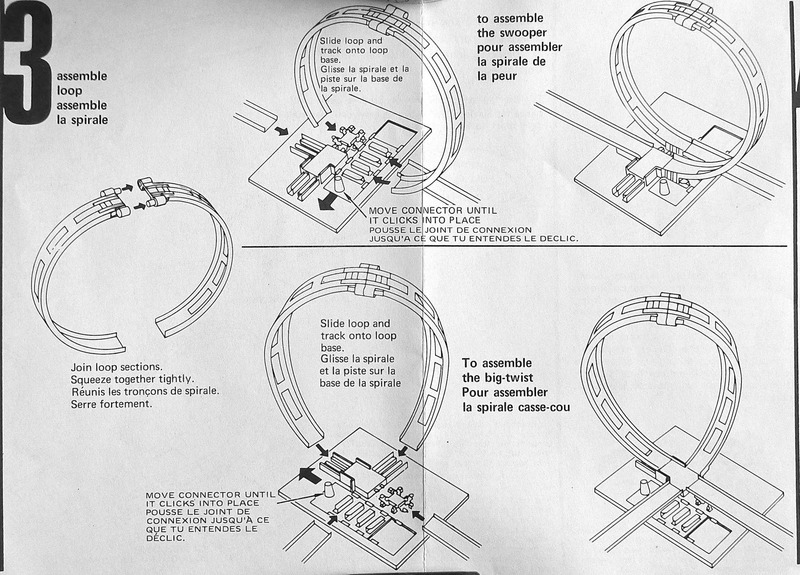 Instructions – layouts. 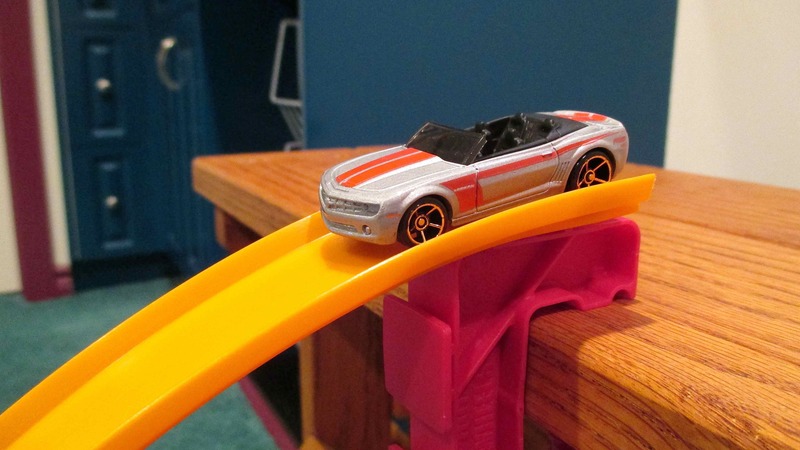 Copyright Mattel, Inc. 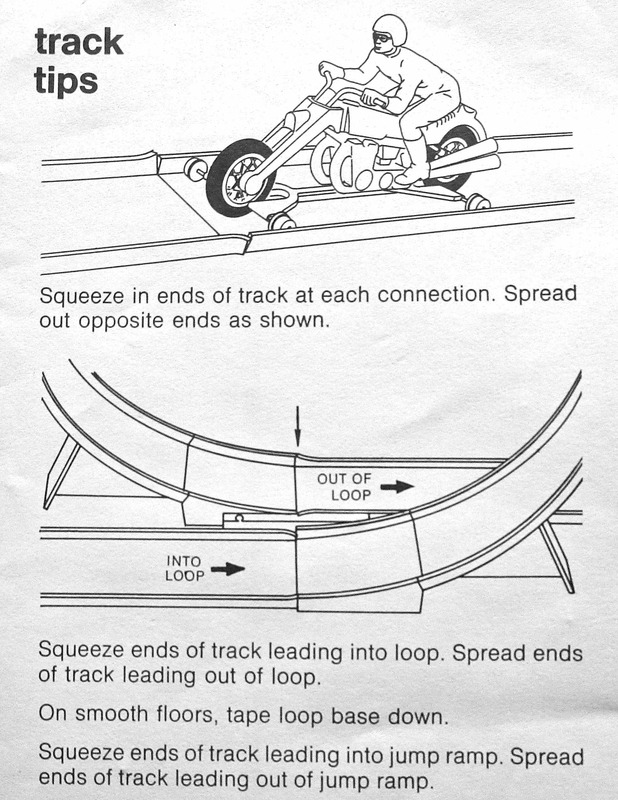 Instructions for Sizzlers tracks. 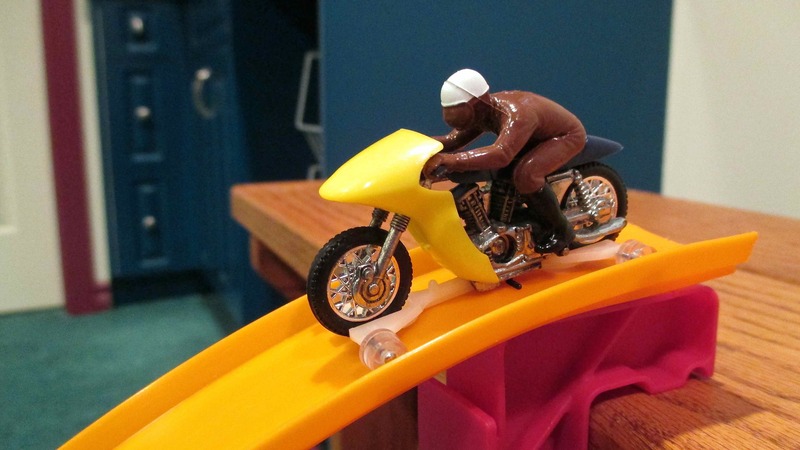 Copyright Mattel, Inc. 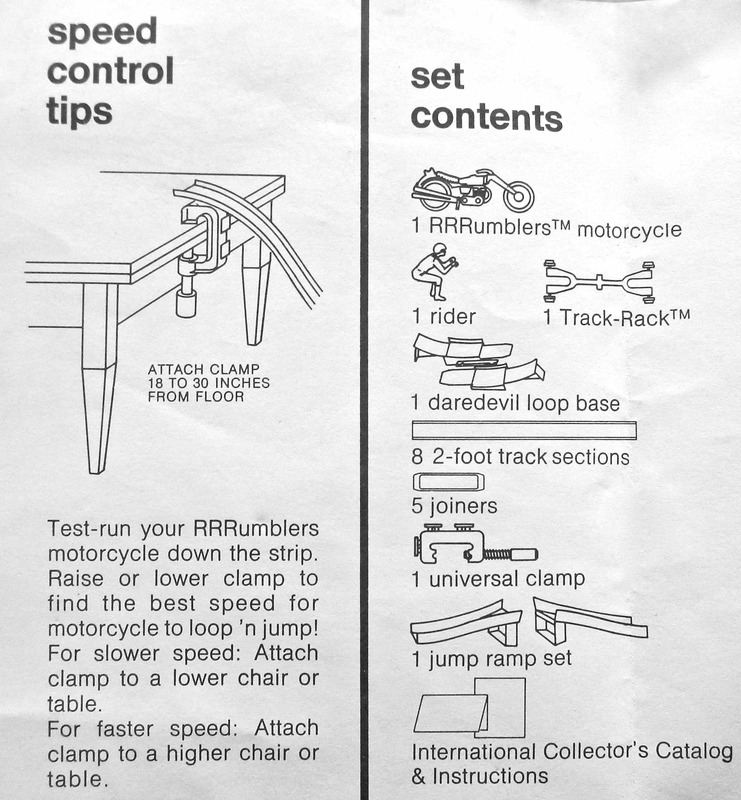 Instructions – track tips & contents list. 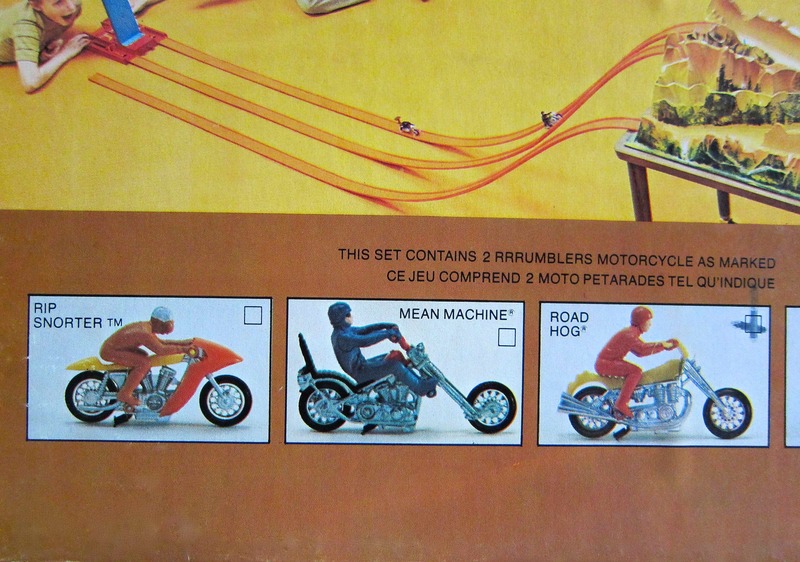 Copyright Mattel, Inc.
For track time I’m going to use an orange 1971 RRRumblers Road Hog and a silver Camaro Concept Convertible. Here’s a run down the two layouts. 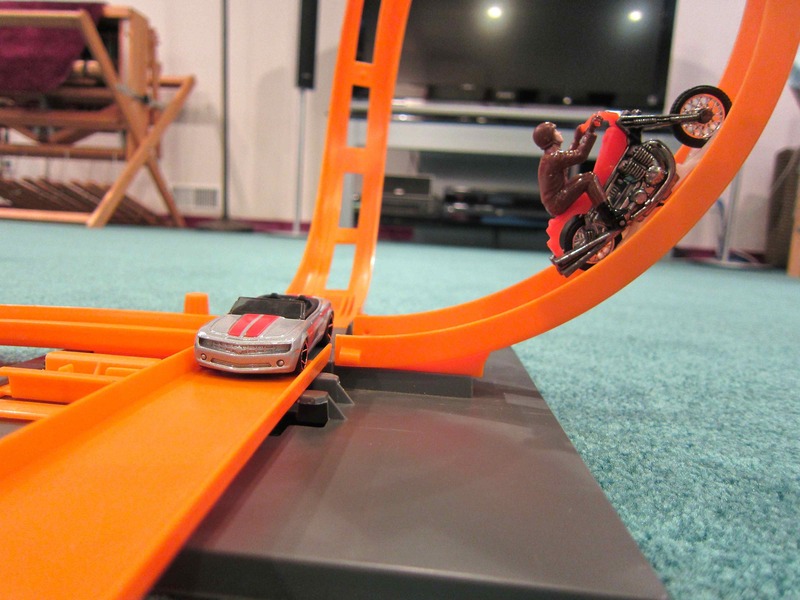 Now a switch to the Big-Twist loop with the Road Hog motorcycle in hot pursuit. 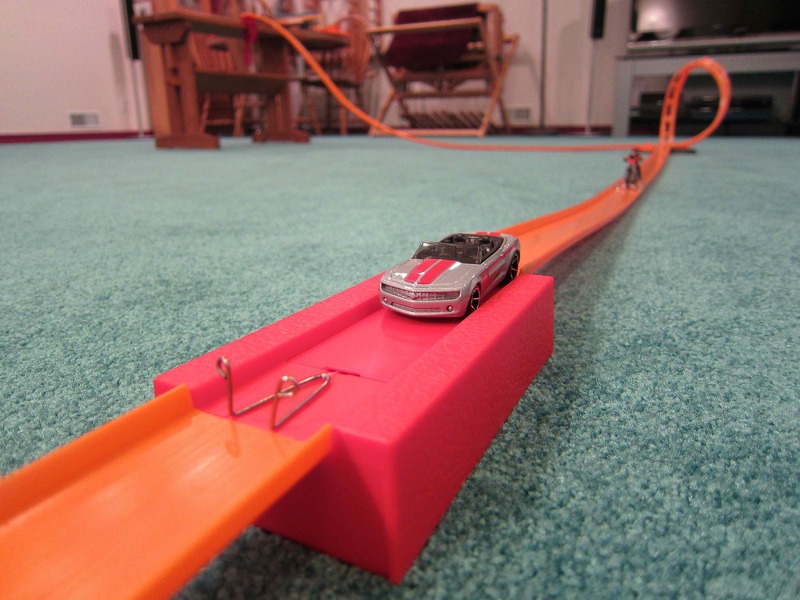 Camaro into the loop. Road Hog coming fast. No hit. 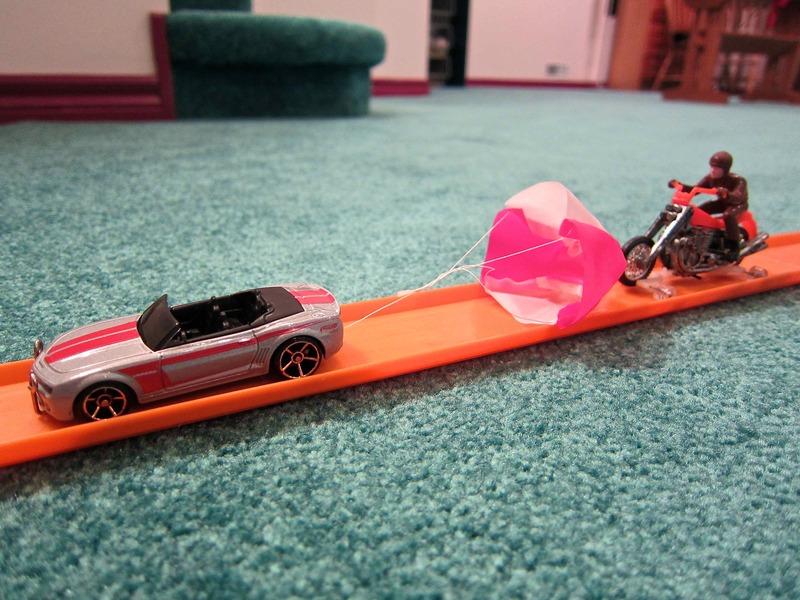 Camaro heads for the ‘chute trap. Road Hog climbs the loop. 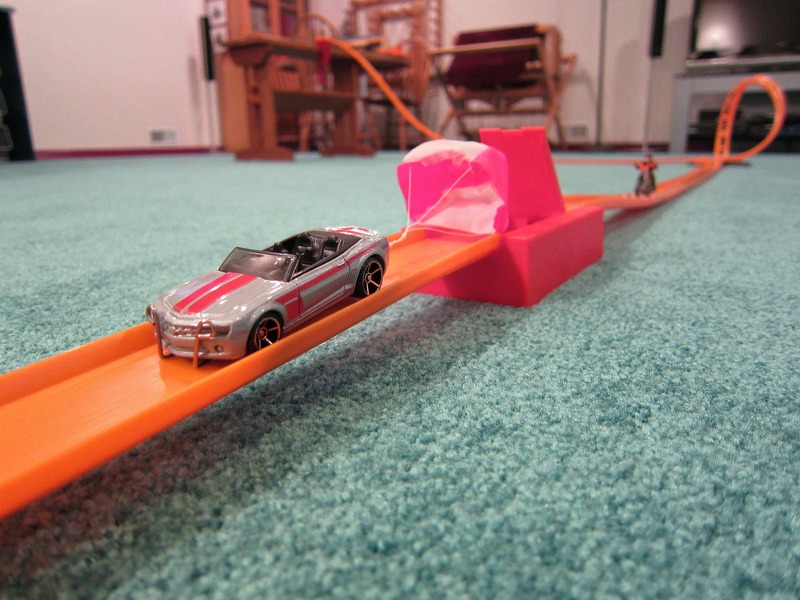 Speeding into the ‘chute trap. 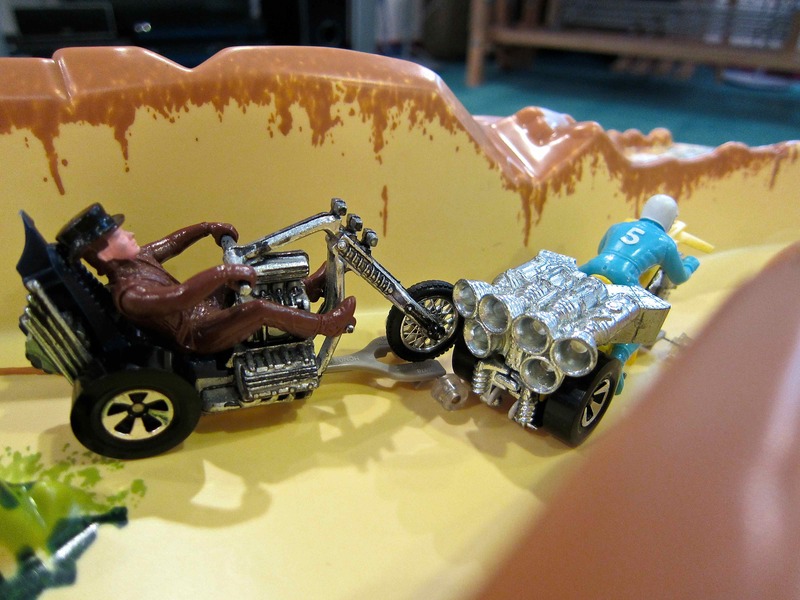 Road Hog pulls in behind. Out of room & out of track. 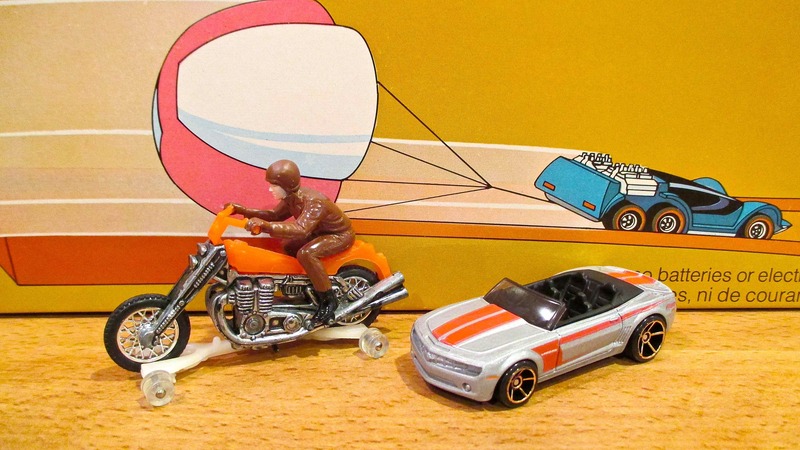 Take a look at my YouTube video to see these two vehicles tackle the Dizzy-Dare Set. So there you have it. 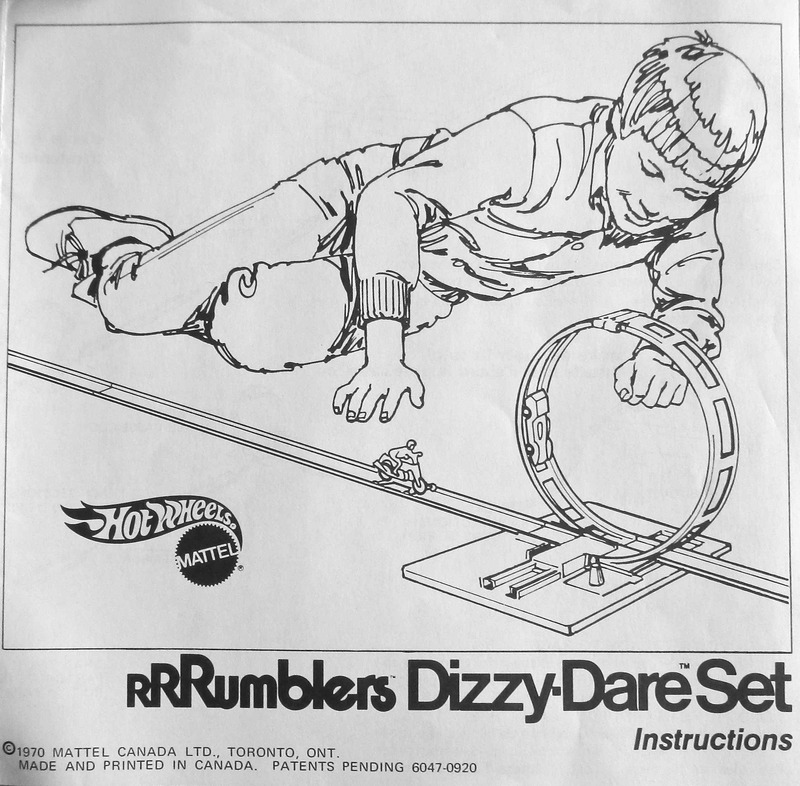 The 1971 Hot Wheels RRRumblers Dizzy-Dare Set. Box art – front. 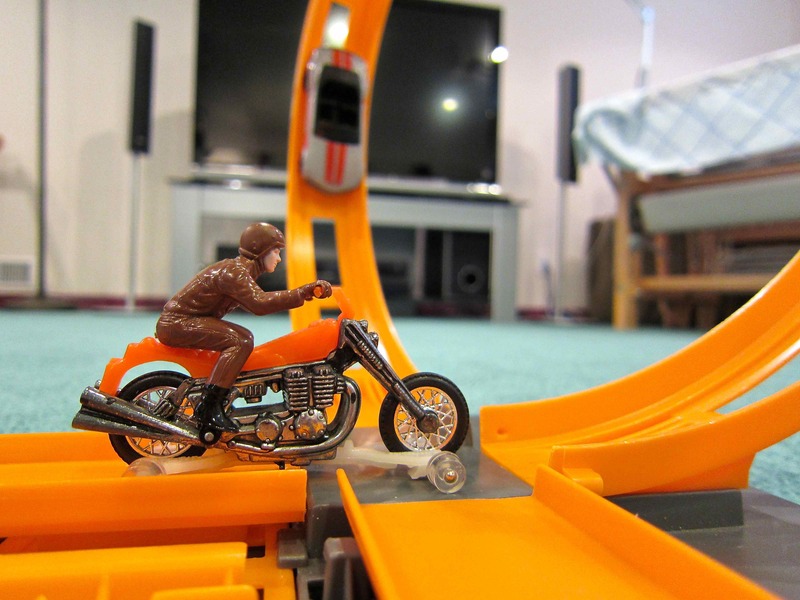 Close-up of a Road Hog in the Big-Twist Loop. Box art – front. 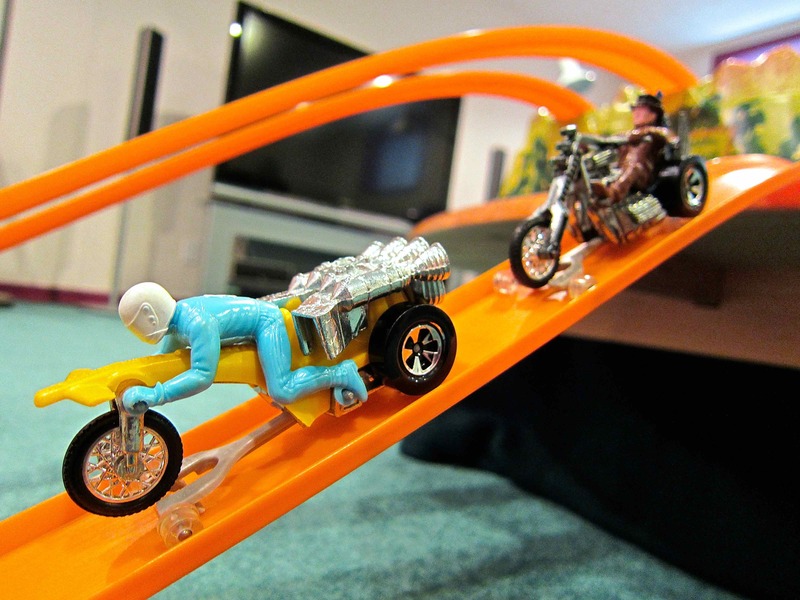 Close-up of Hot Wheels Six Shooter poppin’ the drag ‘chute. Box art- back. Close-up of picture. A United Kingdom version of the same set. 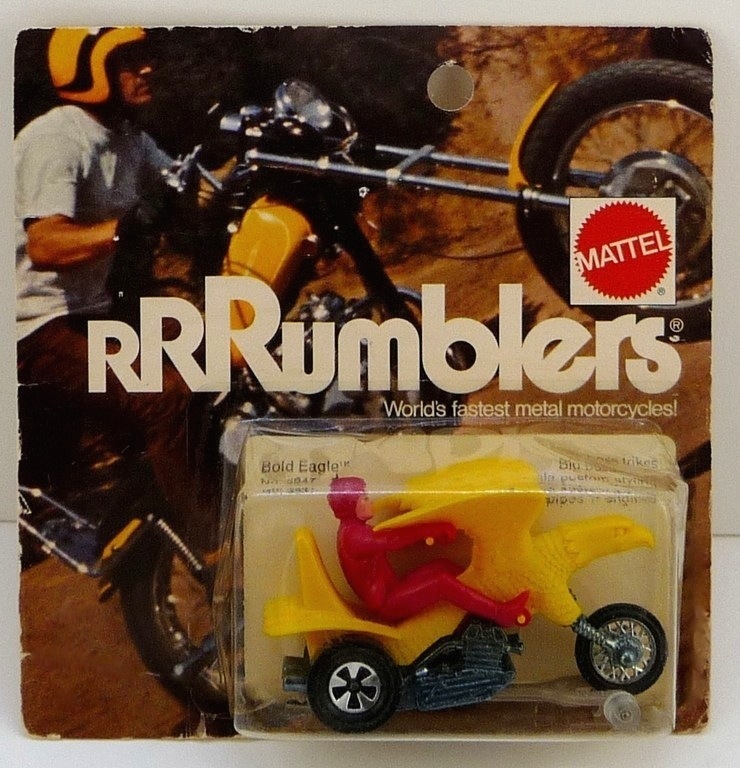 No view window to see the included vehicles and the RRRumblers logo is deemphasized. 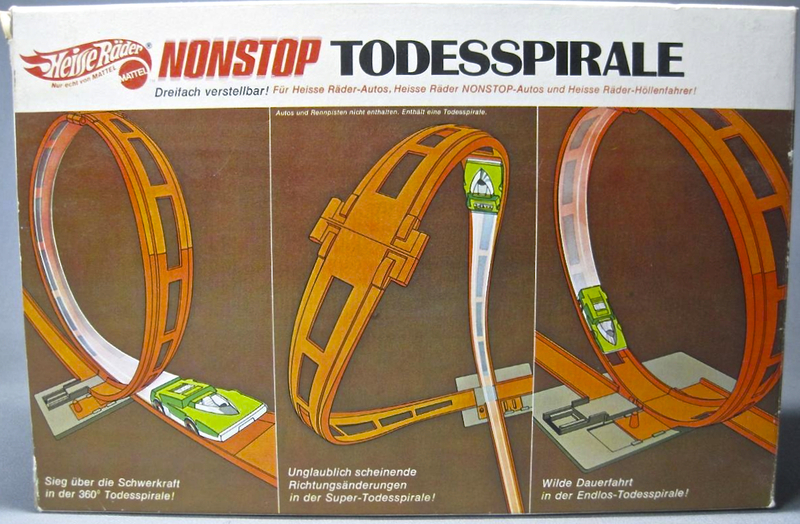 A German version of the Stunt Loop Pak. Courtesy eBay. 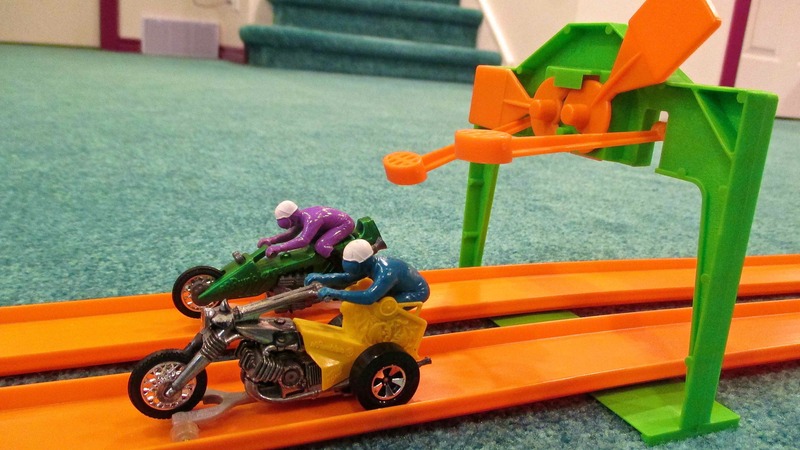 Double-loop drag race sets are a staple of the early Hot Wheels years. 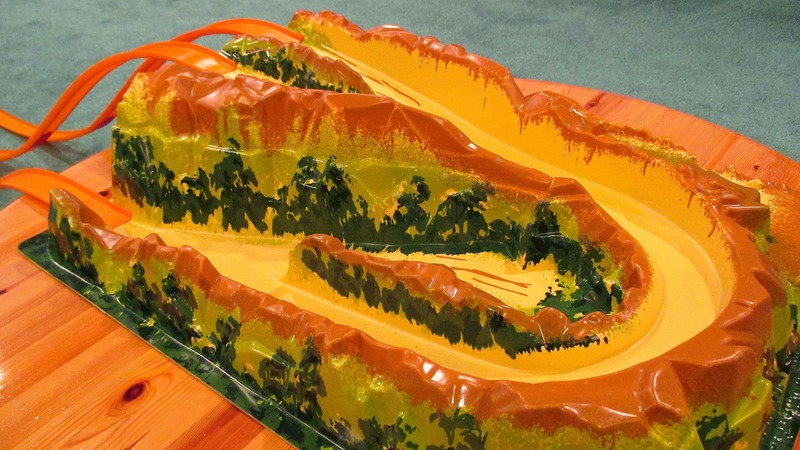 In 1969 we have the Double-Dare Race Action Set. 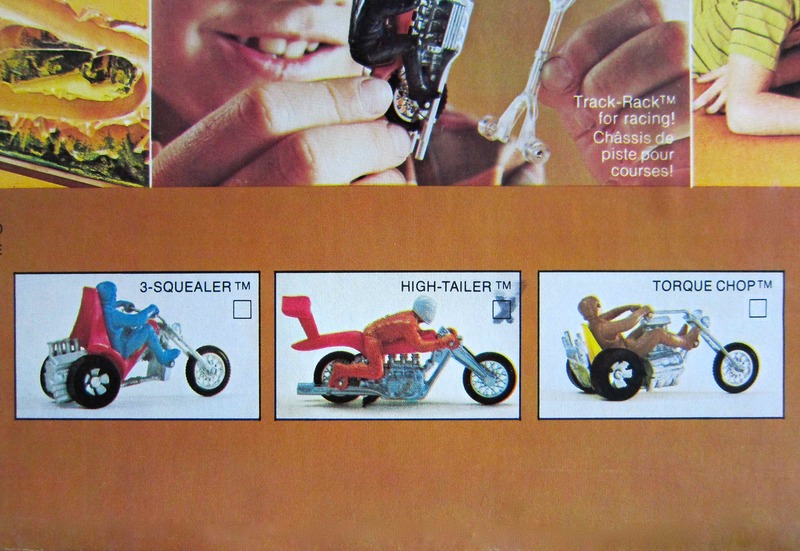 For 1970 there is the Mongoose & Snake Drag Set plus the Twin ‘Chute Action Set (UK). 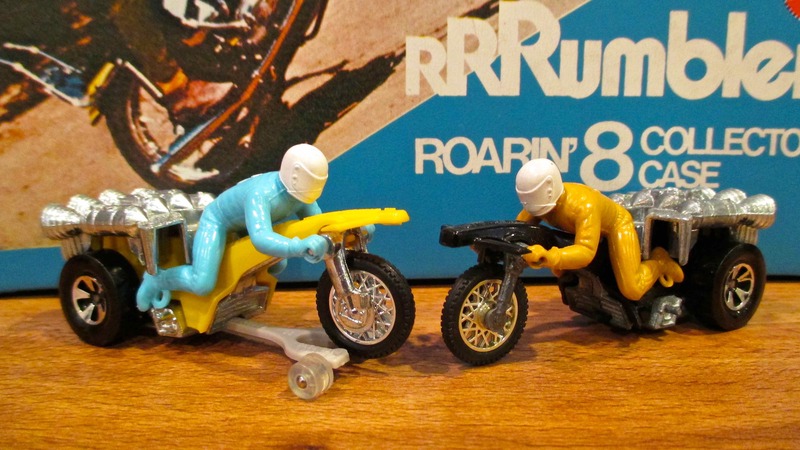 And 1971 brings us the RRRumblers Daring Duo Set (UK) and the RRRumblers Rip Roarin’ Set (Australia). The Daring Duo Set. From http://www.GranToros.com. 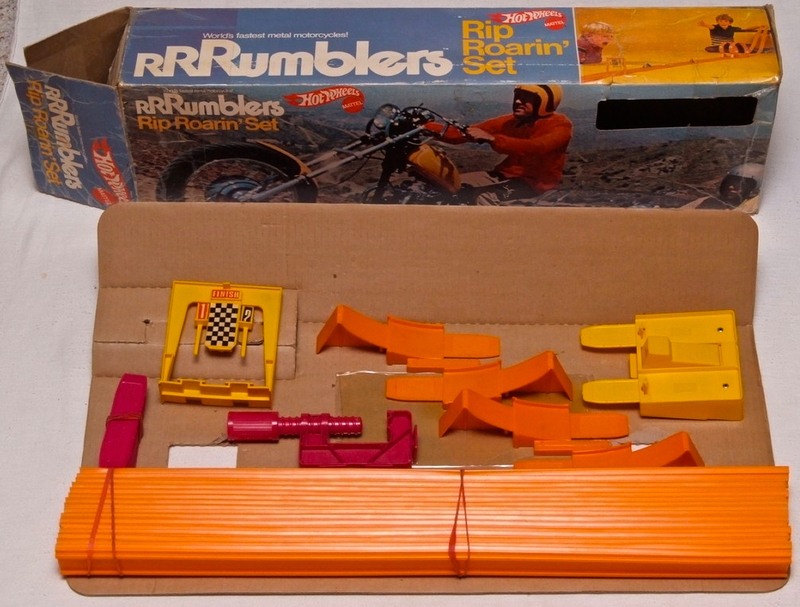 The Rip Roarin’ Set. Courtesy eBay. Rip Roarin’ Set box art – side and back. Courtesy eBay. 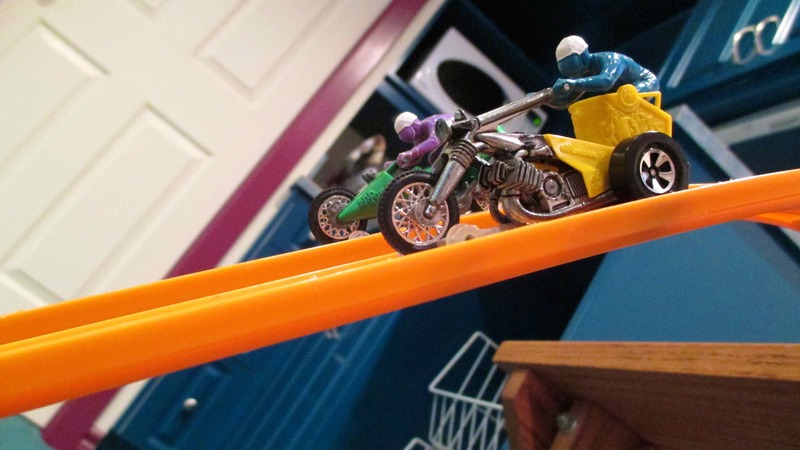 and the Rip Roarin’ Set uses a standard finish gate with the contact arms cut off to allow the taller RRRumblers motorcycles to pass through. 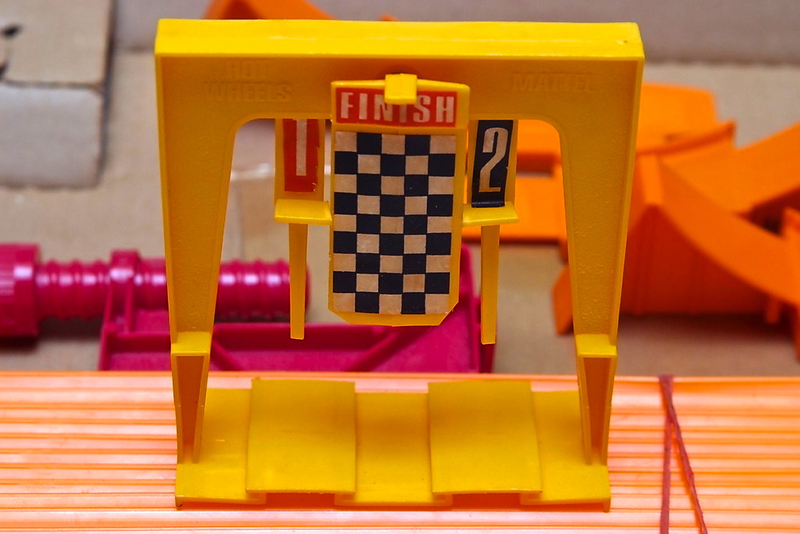 Modified finish gate of the Rip Roarin’ Set. Courtesy eBay. 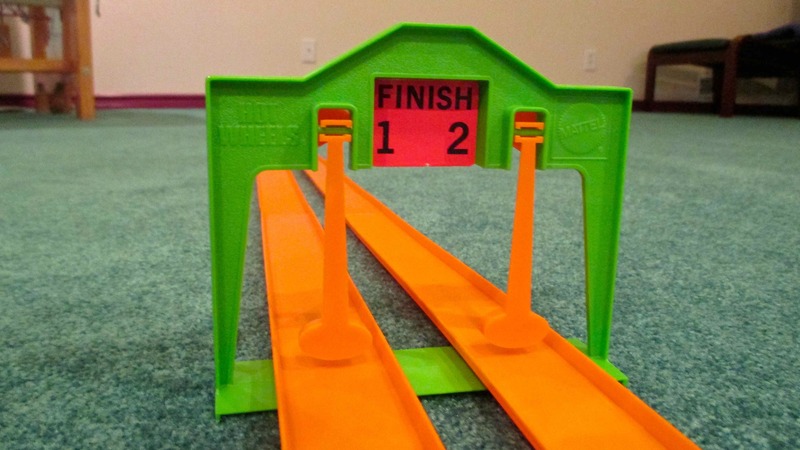 The Daring Duo Set includes 28 feet of orange track, 10 joiners, 1 universal clamp, 1 start gate, 1 automatic finish gate and 2 daredevil loops. 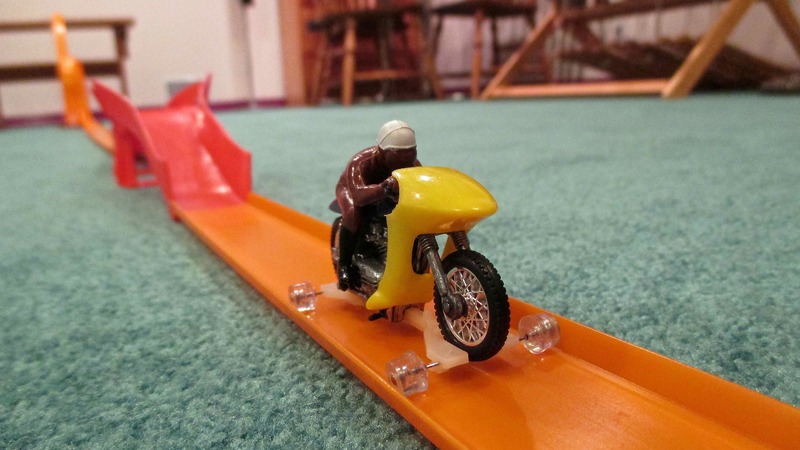 Here’s a run down the Daring Duo track. 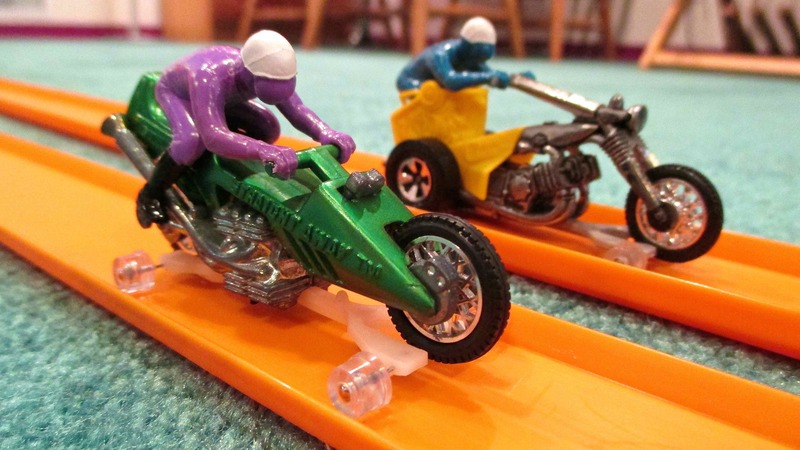 At the start: green Straight Away in lane 2 and yellow Choppin’ Chariot in lane 1. 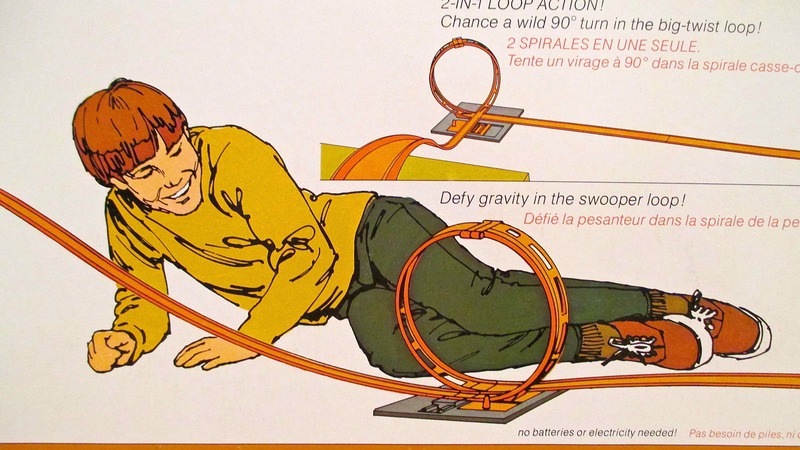 Round and down the loops. Out of the loops and onto the straightaway. Here’s a video of the Daring Duo Set in action. So there you have it. 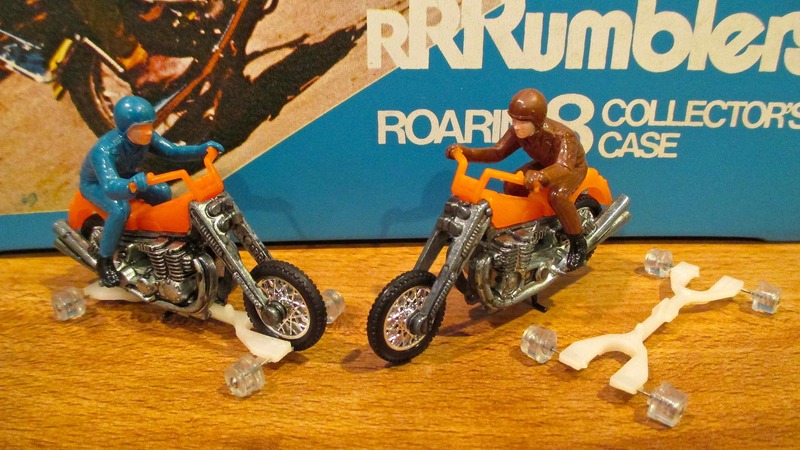 The 1971 RRRumblers Daring Duo Set from the U.K. Daring Duo Set on the bottom (German version). Courtesy http://www.GranToros.com. Rip Roarin’ Set made in Australia. Courtesy eBay. Rip Roarin’ Set box art – end. Courtesy eBay. Rip Roarin’Set contents. Courtesy eBay. 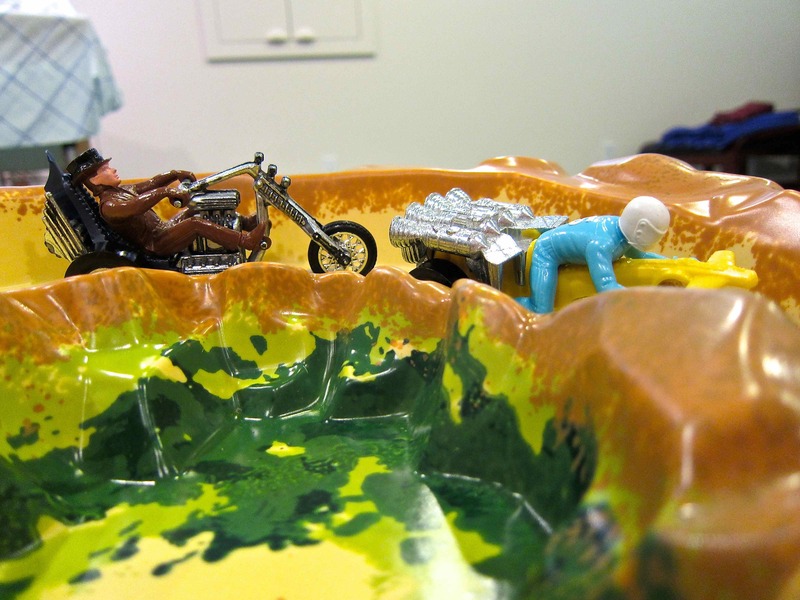 Rip Roarin’ Set contents: close-up. Courtesy eBay. 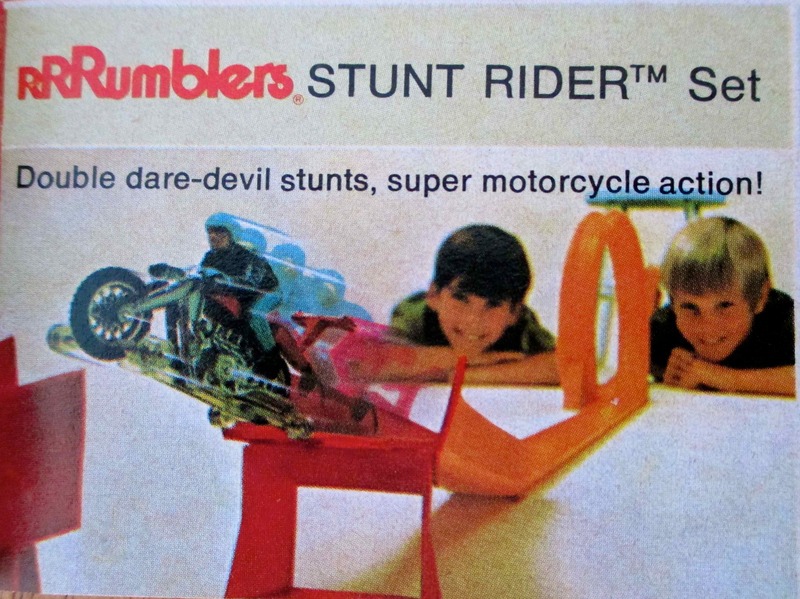 To demonstrate that RRRumblers motorcycles are as versatile as Hot Wheels cars, Mattel introduced the 1971 Stunt Rider Set. 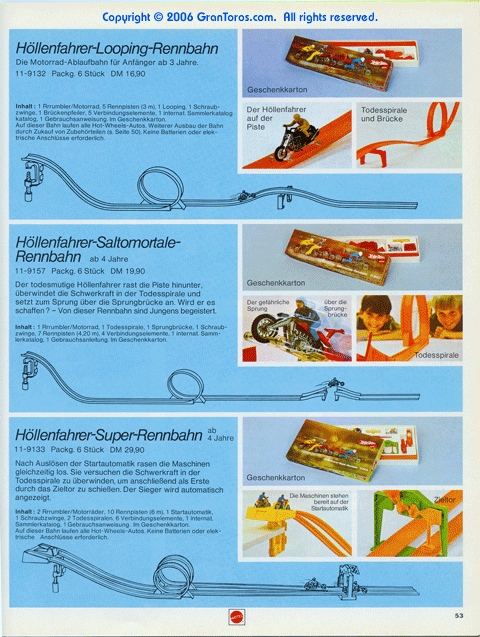 Box art – front, side and end. Courtesy eBay. 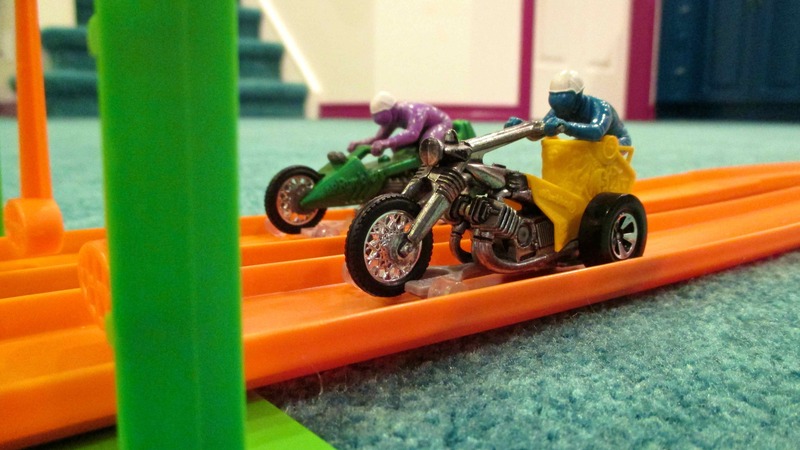 On this track RRRumblers tackle a daredevil loop, jump a ramp and ride through 16 feet of track. The layout. 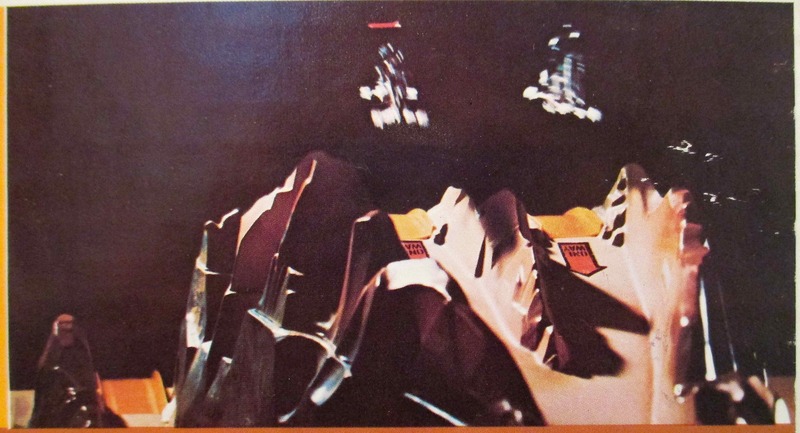 From 1971 Collector’s catalogue. Copyright Mattel, Inc. 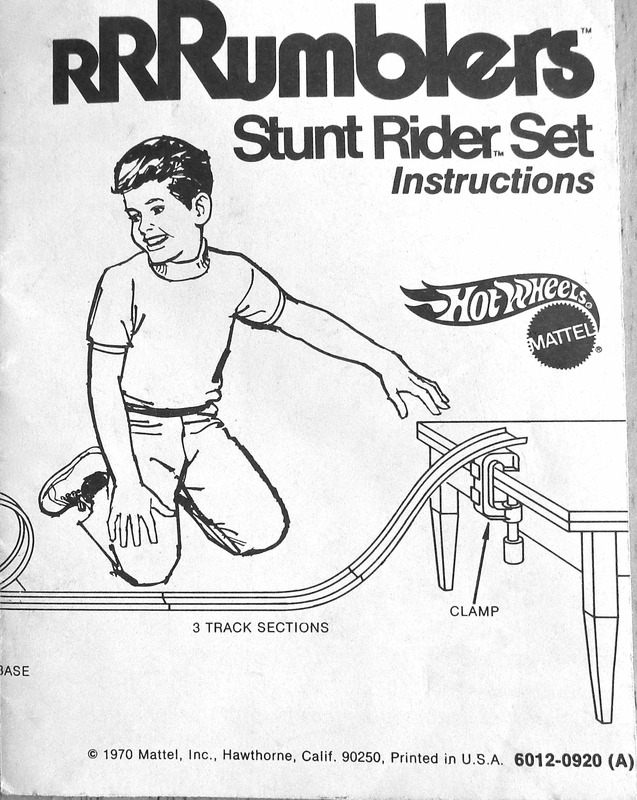 Here are the Stunt Rider Set instructions. Click on any image to enlarge. 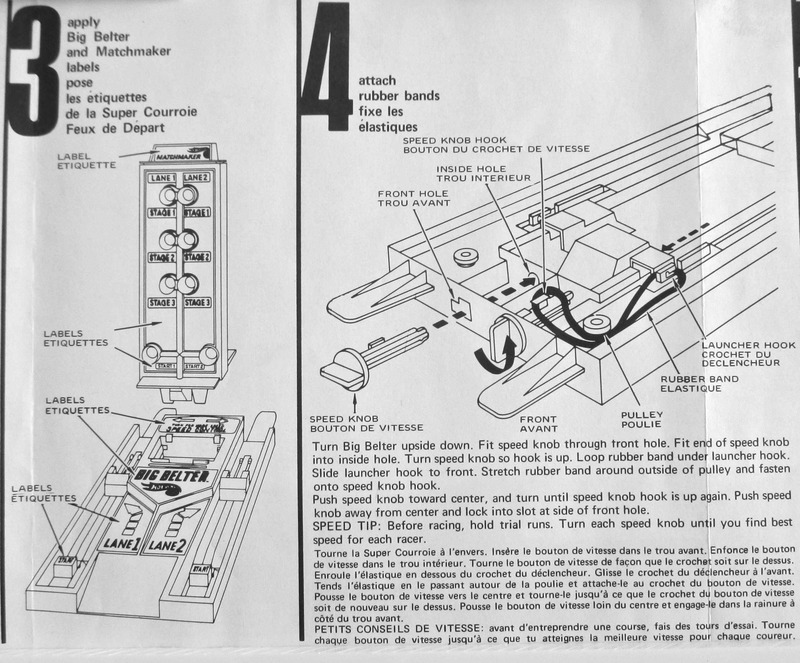 Instructions – front page: close-up. 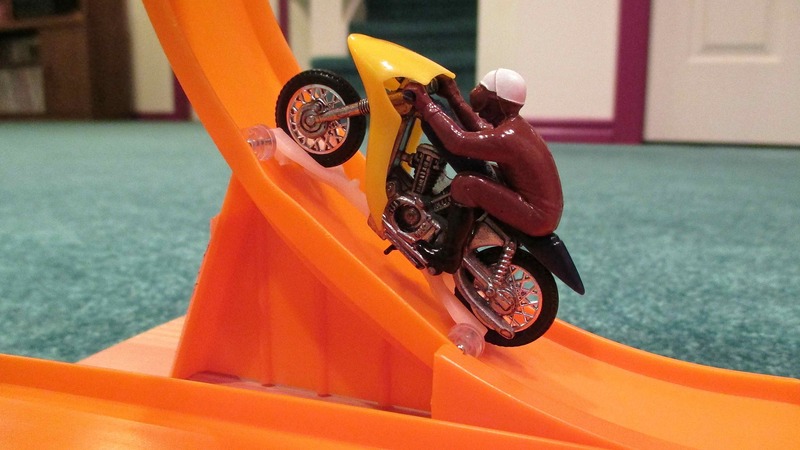 Copyright Mattel, Inc. 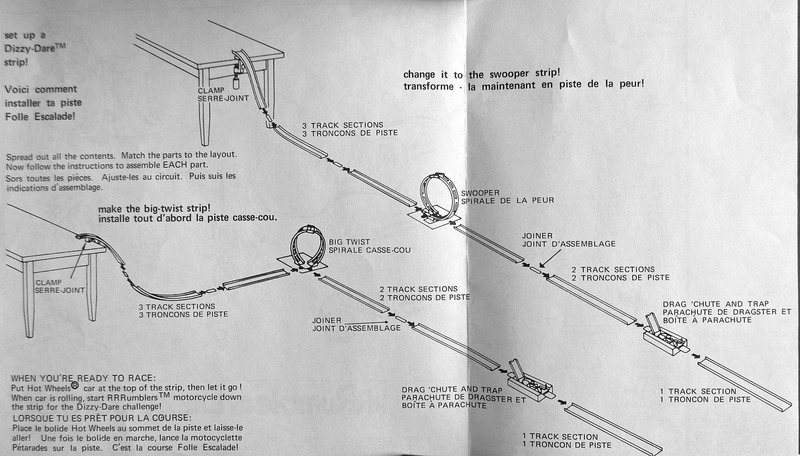 Instructions – front page track layout. Copyright Mattel, Inc. 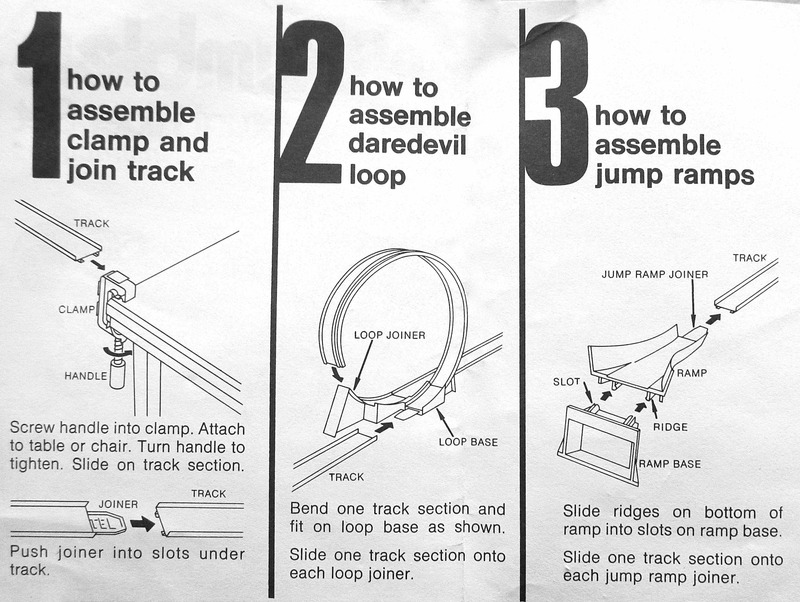 Instructions – steps 1, 2 & 3. Copyright Mattel, Inc. 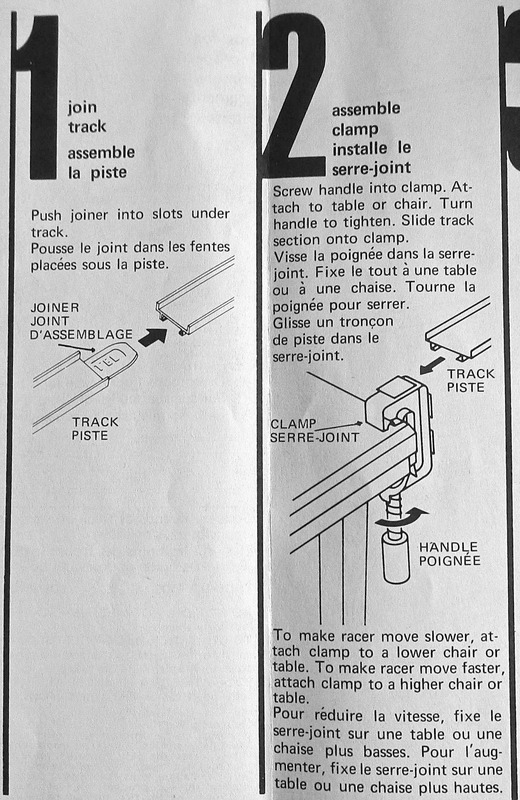 Instructions – track tips. 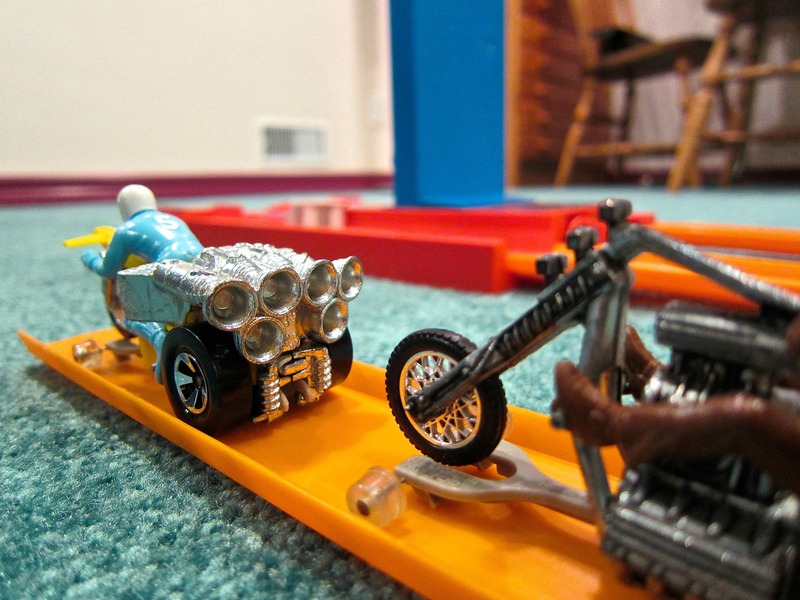 Copyright Mattel, Inc. Instructions – more tips and contents. 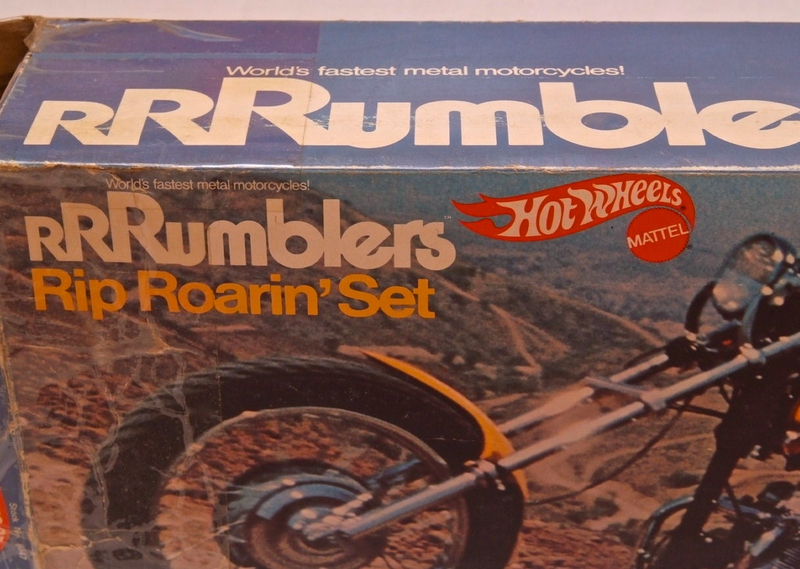 Copyright Mattel, Inc.
For today’s demonstration I’m running two vintage RRRumblers. 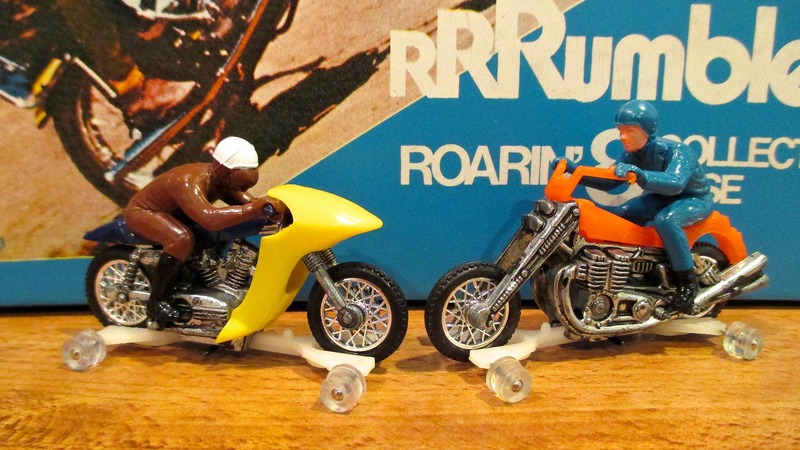 l to r: yellow/blue 1971 Rip Snorter and orange 1971 Road Hog. Here’s a run through the track. Running the length of the track. 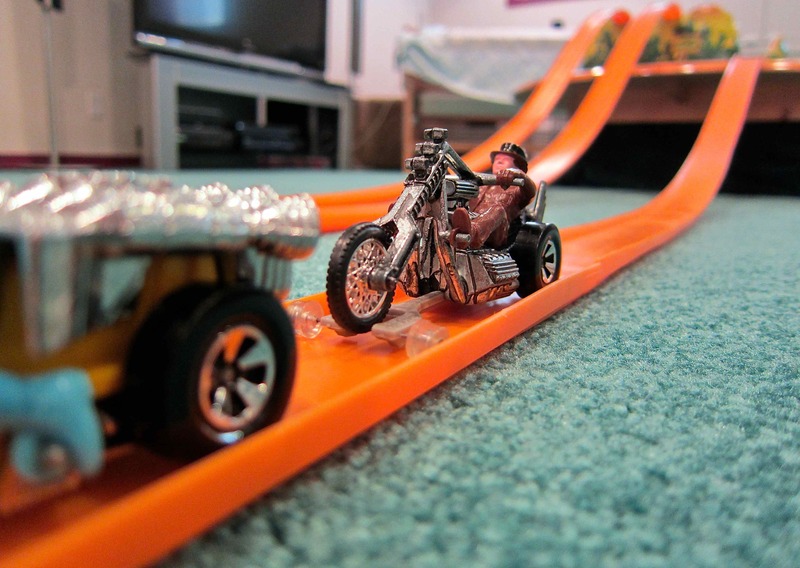 See how the Rip Snorter and Road Hog perform on the Stunt Rider Set in my YouTube video. So there you have it. 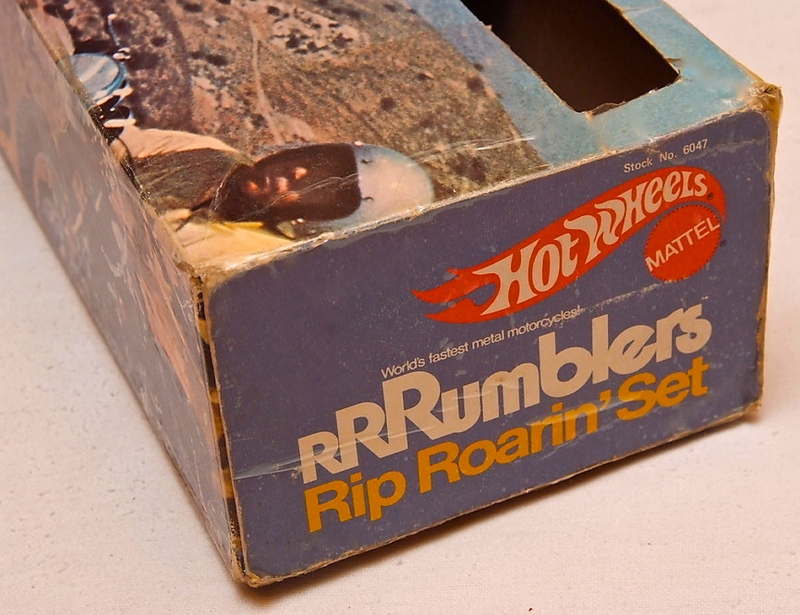 The 1971 Hot Wheels RRRumblers Stunt Action Set. Box art – front. 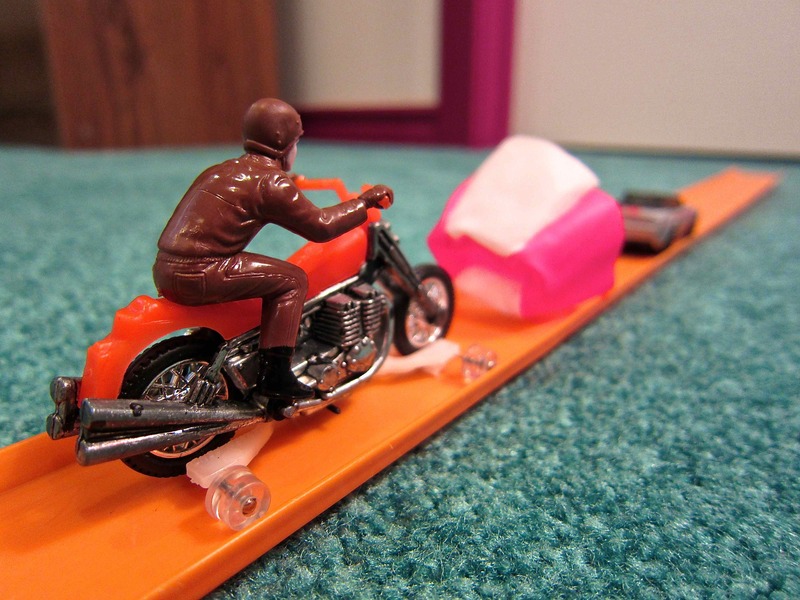 High-Tailer motorcycle in the window. Courtesy eBay. 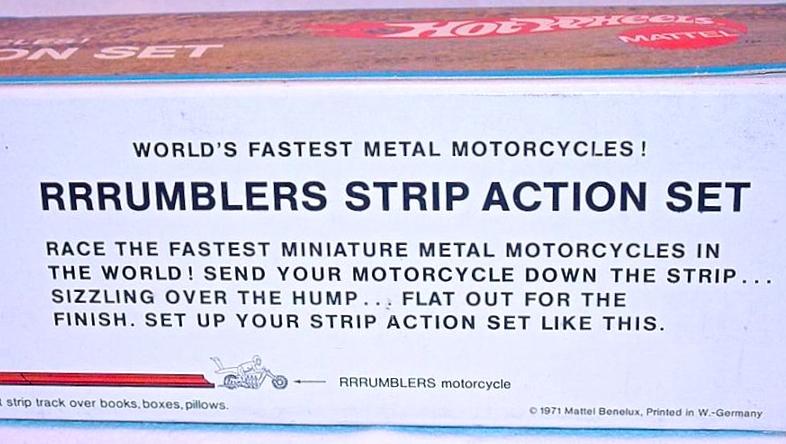 Box art – back. Close-up. Courtesy eBay. 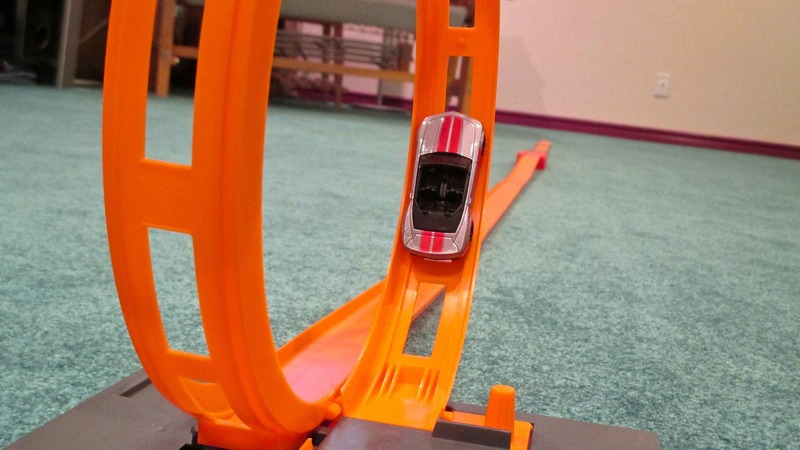 An even more basic RRRumblers track was made in Germany; the Strip Action Set. 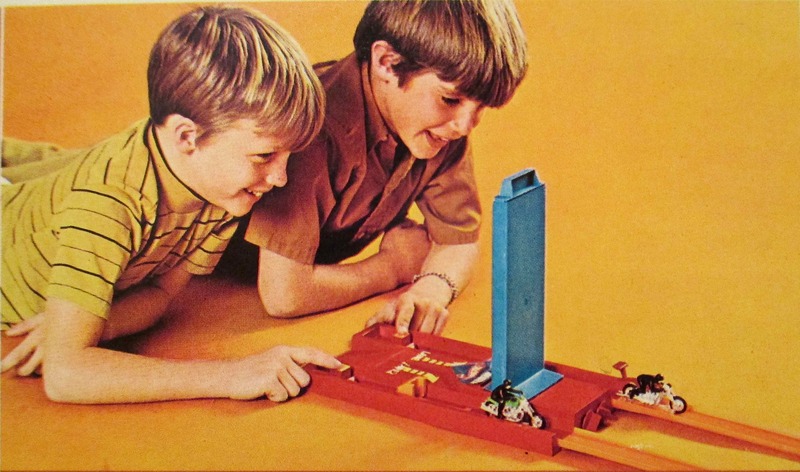 Box art – side and end. Courtesy eBay. 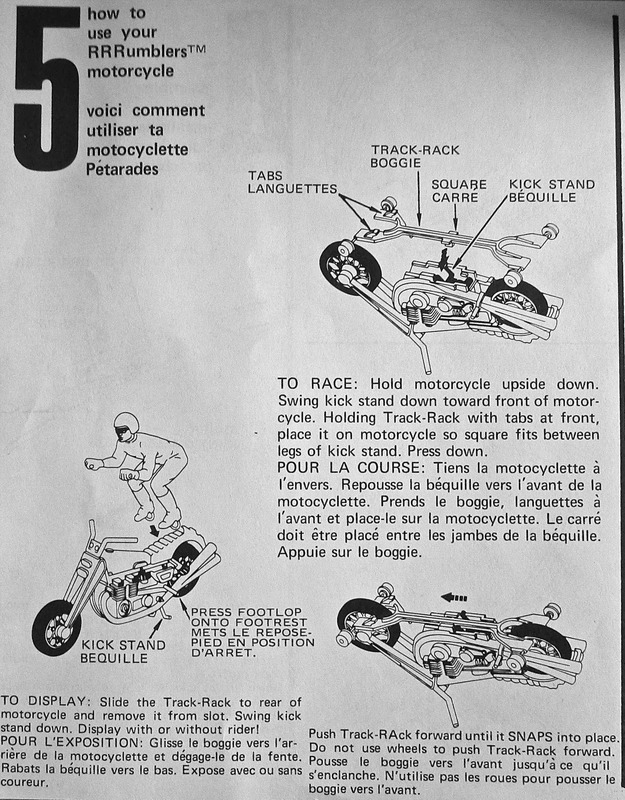 Instructions and motorcycle. Courtesy eBay. 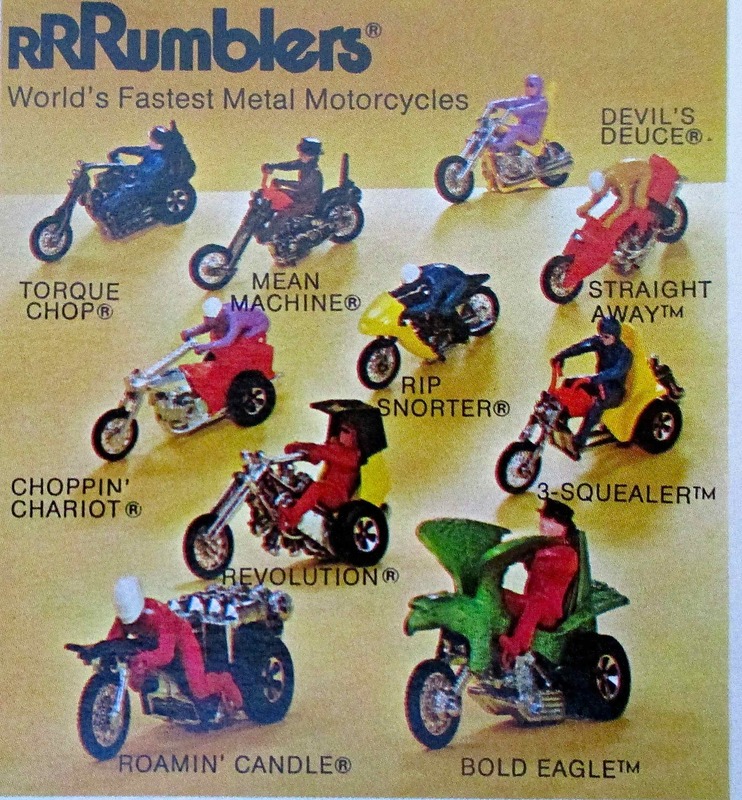 One of the big things that Mattel promised for 1971 was the RRRumbers line up. 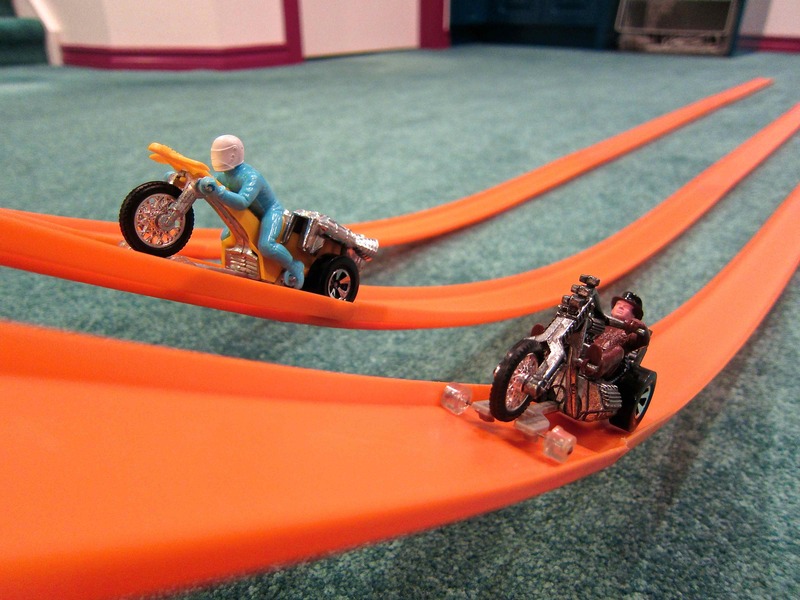 Motorcycles that actually ran on Hot Wheels track. 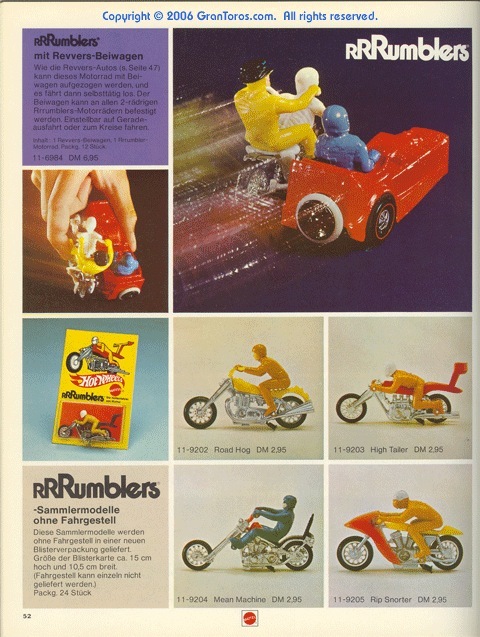 Dealer’s catalogue promoting the new RRRumblers. Courtesy http://www.GranToros.com. 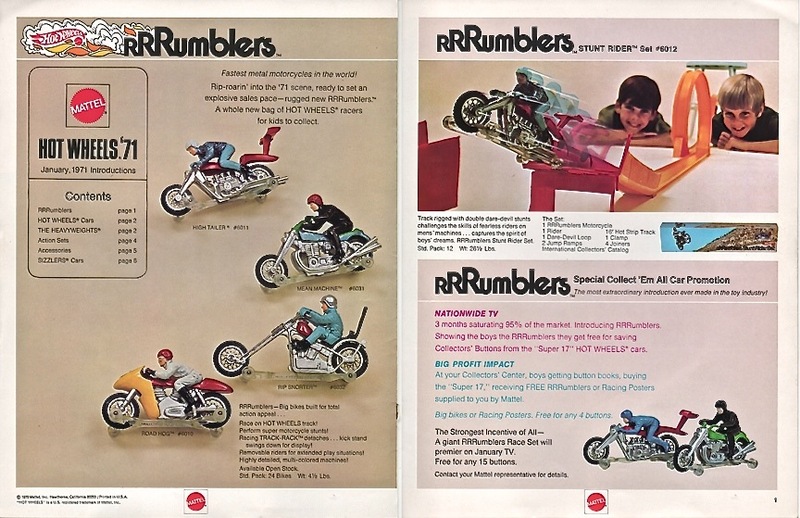 A U.K. ad for RRRumblers. Courtesy eBay. 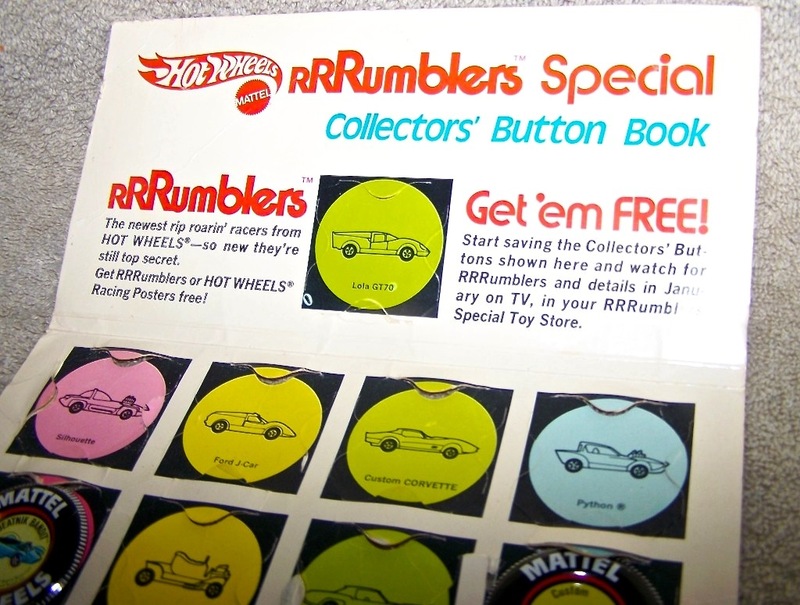 Part of the initial promotional build up involved sending in a set of collector’s buttons from the Hot Wheels car line and receiving a new RRRumblers motorcycle from Mattel. 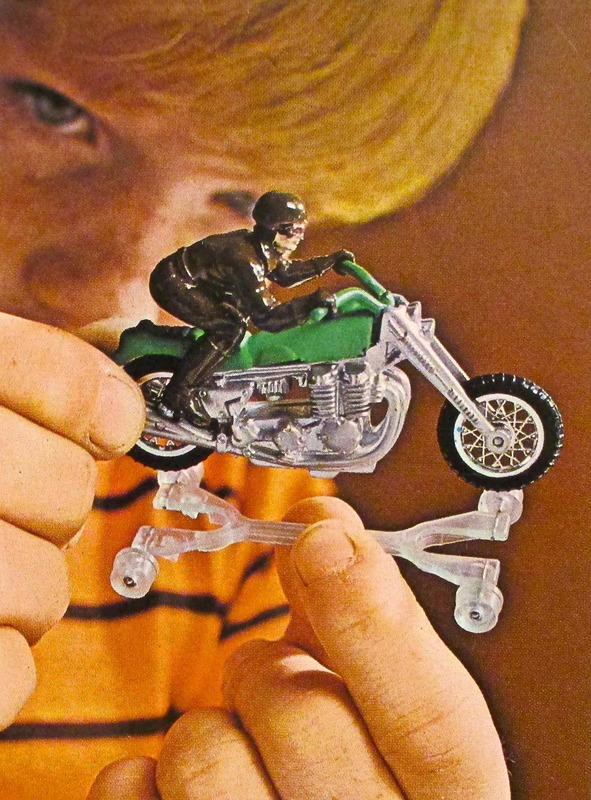 Six models came out in 1971. 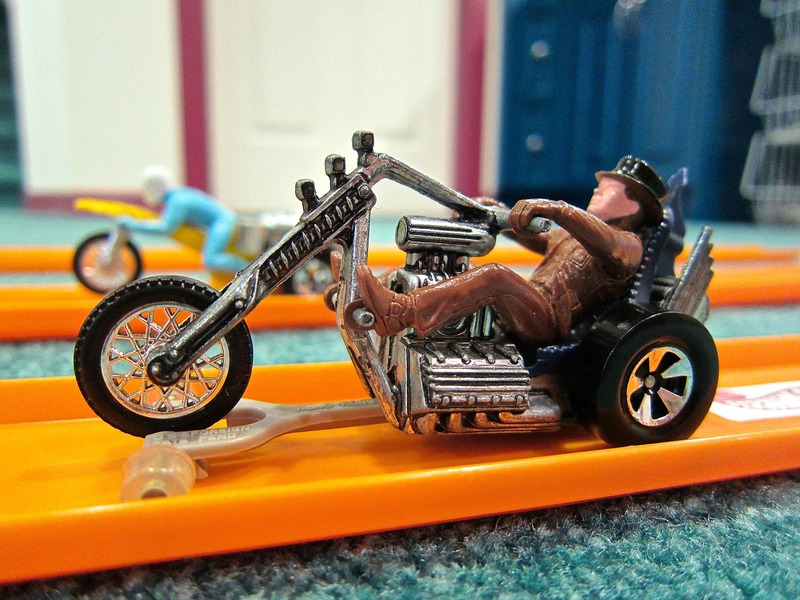 Four are two-wheelers and two are three-wheeled “trikes”. They came with their own blister cards. 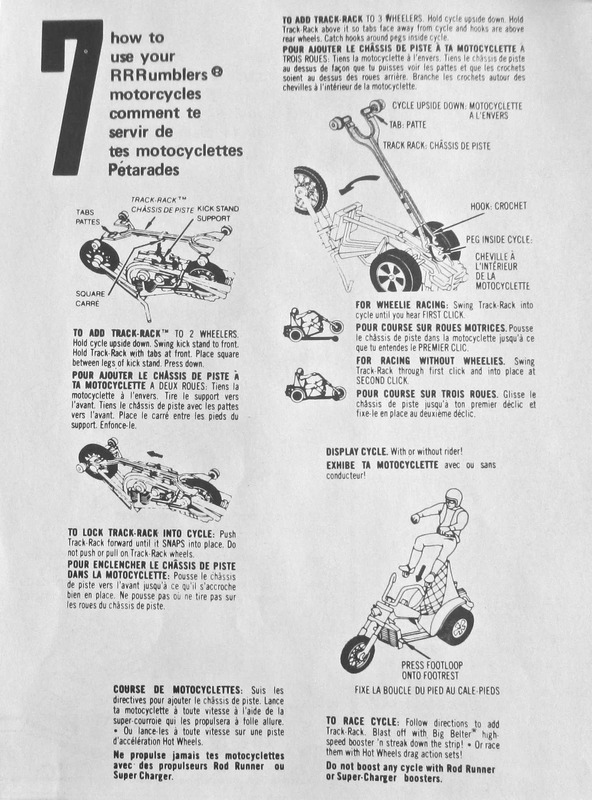 Paper insert that comes with the two-wheeler bikes – front. 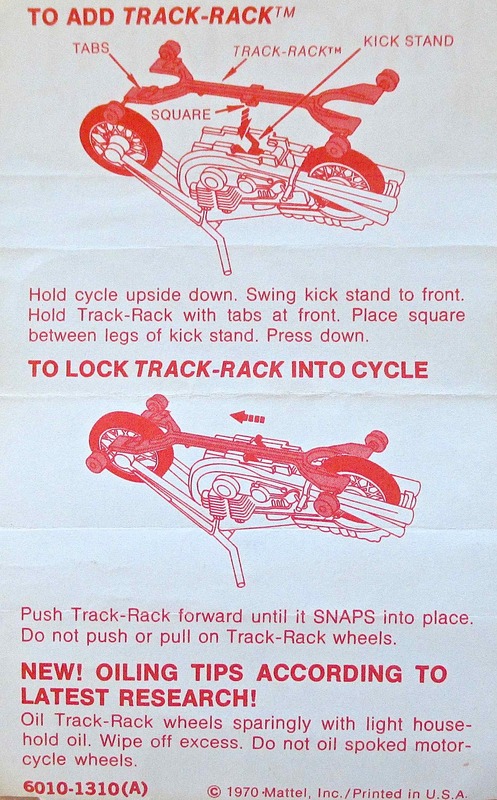 Paper insert that comes with the two-wheeler bikes – back. 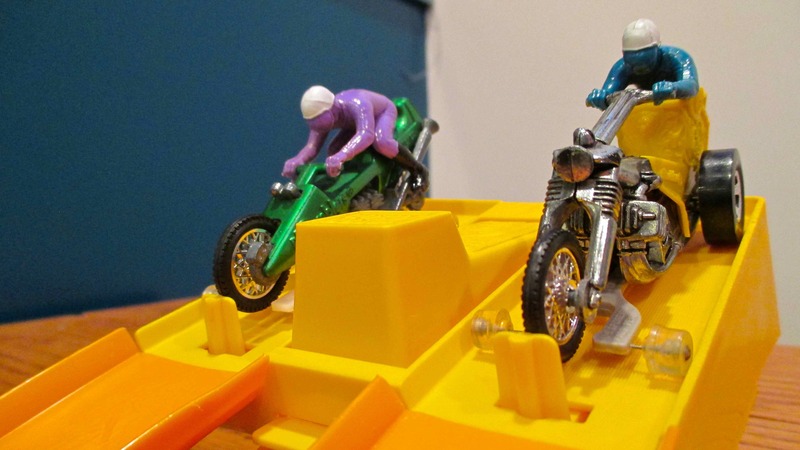 For display purposes, the two-wheelers use a built in center stand to stand up on their own. 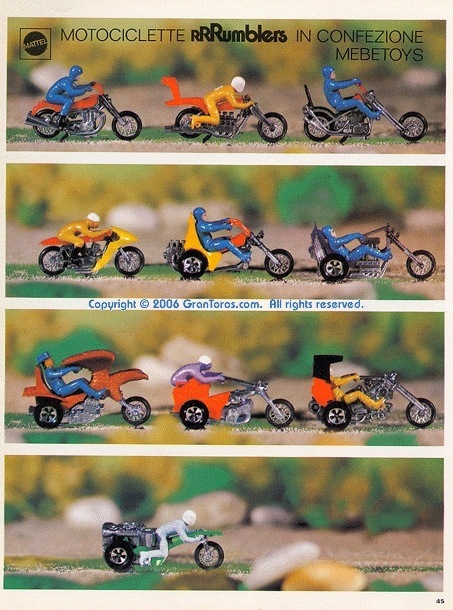 The three-wheelers are naturally stable. 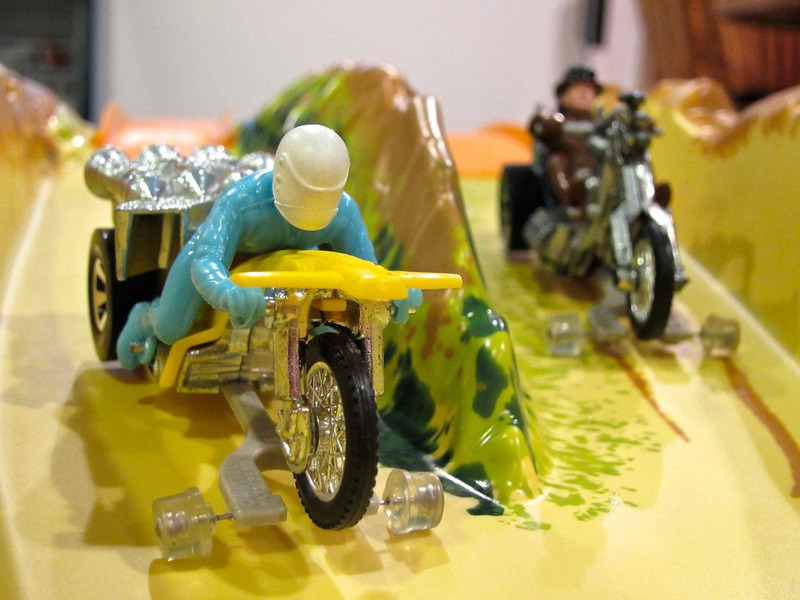 But the magic wasn’t in the cool designs or the accompanying plastic riders. 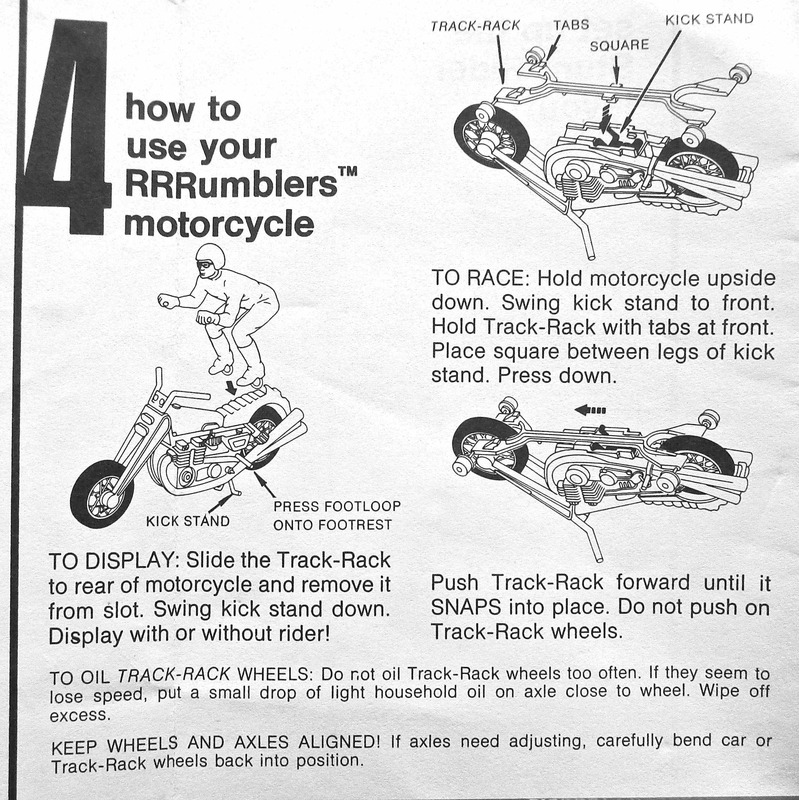 What makes these bikes special is the track-racks that attach to the undercarriages of the motorcycles. 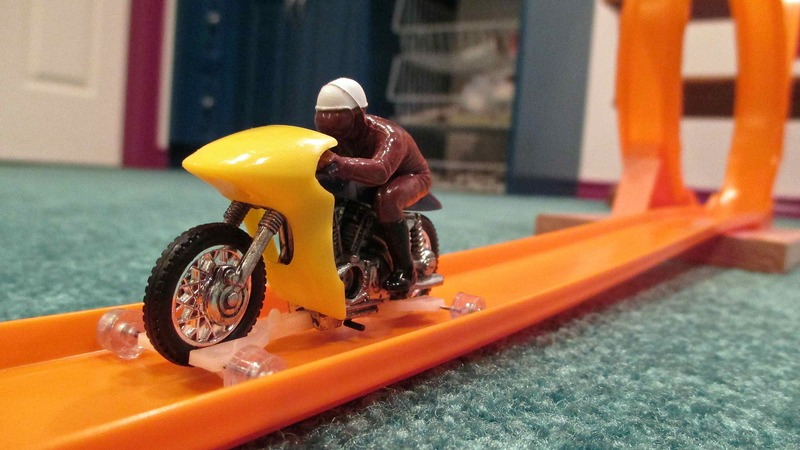 Once installed, these bikes become track worthy. 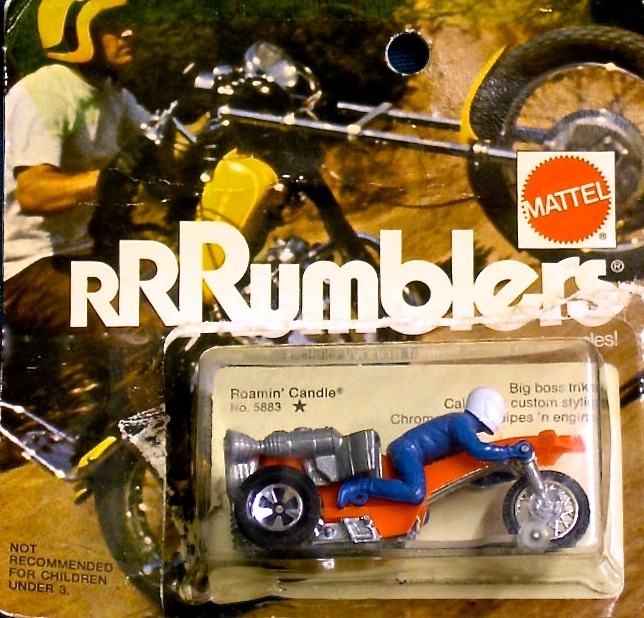 Like their car predecessors, RRRumblers motorcycles are up for anything. 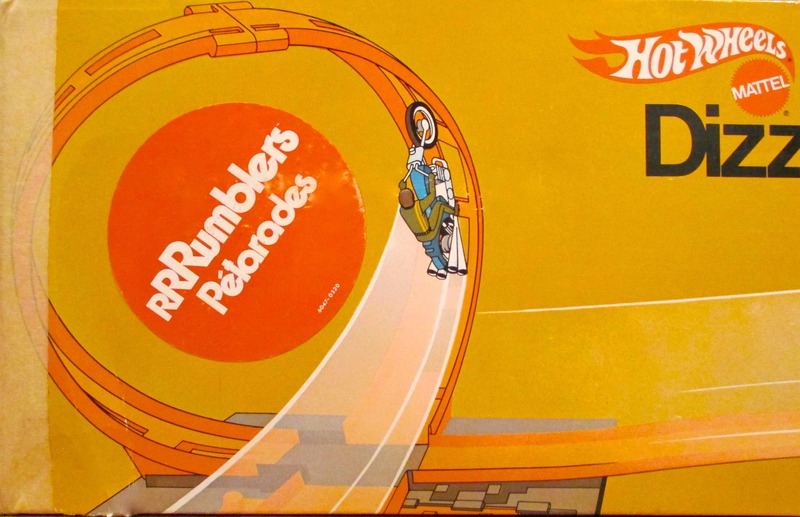 For 1971 there are 5 track sets that run RRRumblers. The Big Belter & Matchmaker. 3. The Daring Duo Set (UK) / Rip Roarin’ Set (Australia). 4. 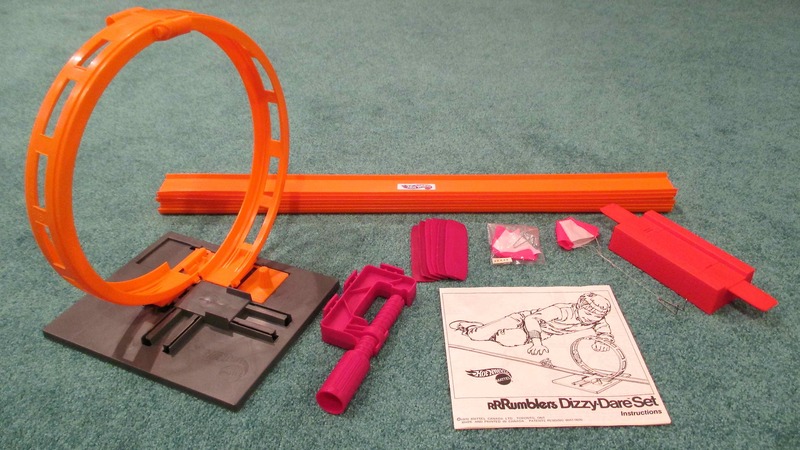 The Dizzy Dare Set. 5. The Mean Mountain Set. 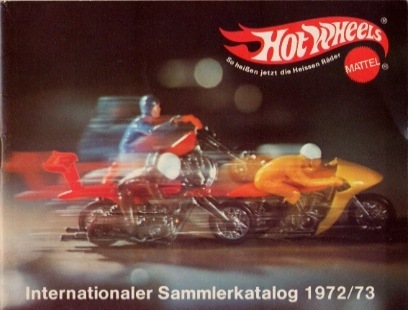 1972 saw six more new models. (Devil’s Deuce, Straight Away, Choppin’ Chariot, Revolution, Roamin’ Candle and Bold Eagle). So there you have it. 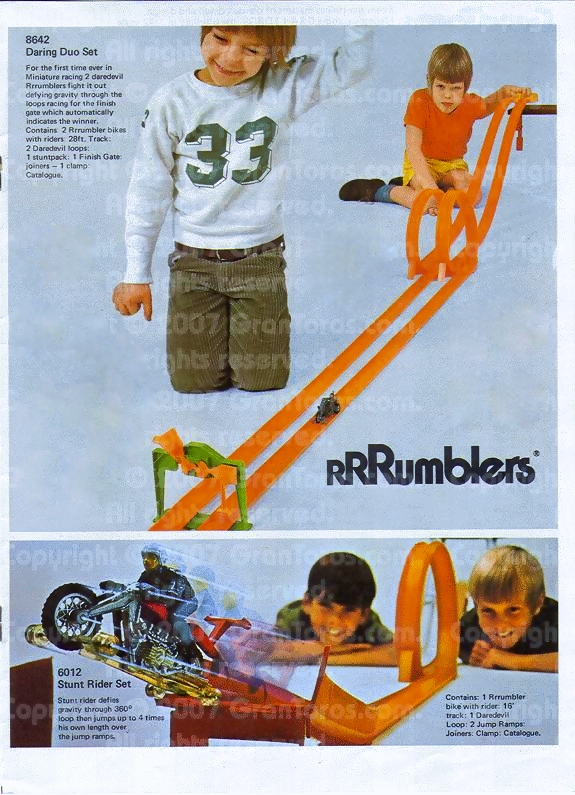 RRRumblers. 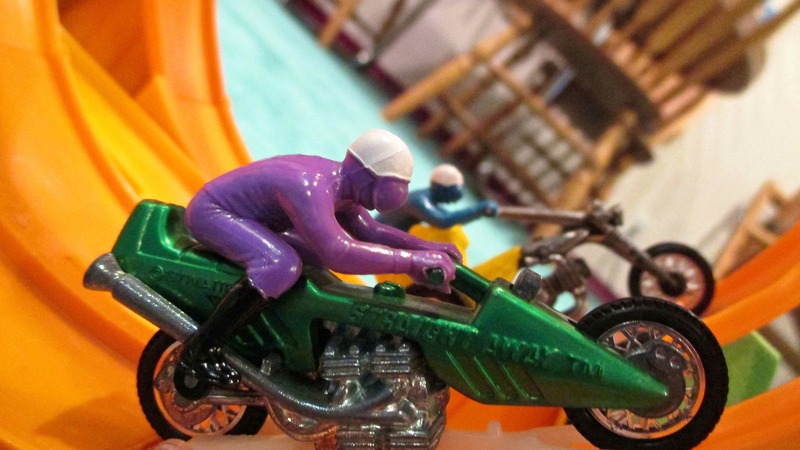 The fastest metal motorcycles in the world. 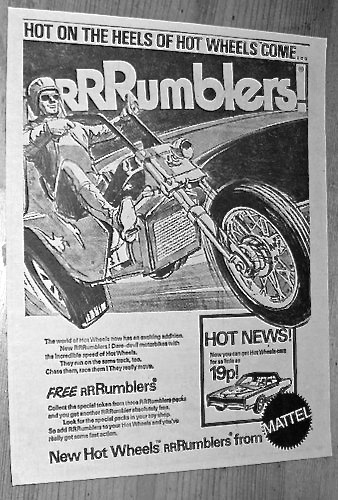 1972 RRRumblers ad. Courtesy eBay. 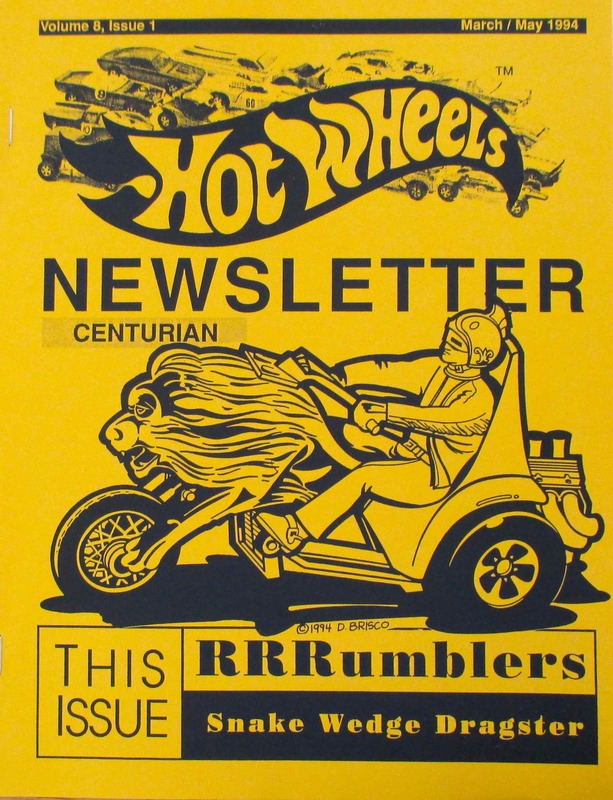 1994 Hot Wheels Newsletter cover featuring RRRumblers. 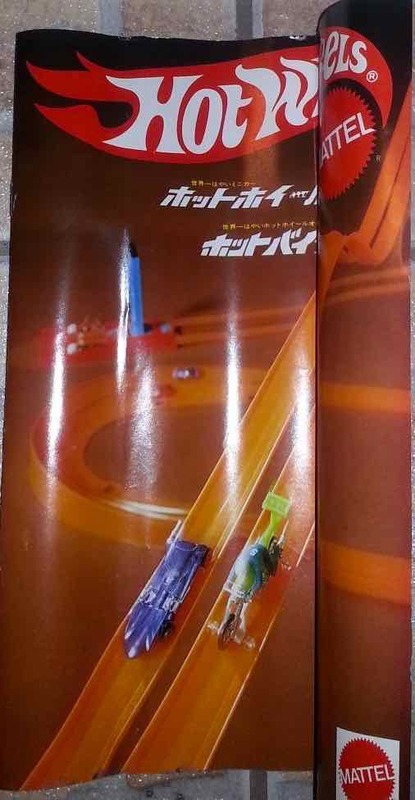 Courtesy Hot Wheels Newsletter. 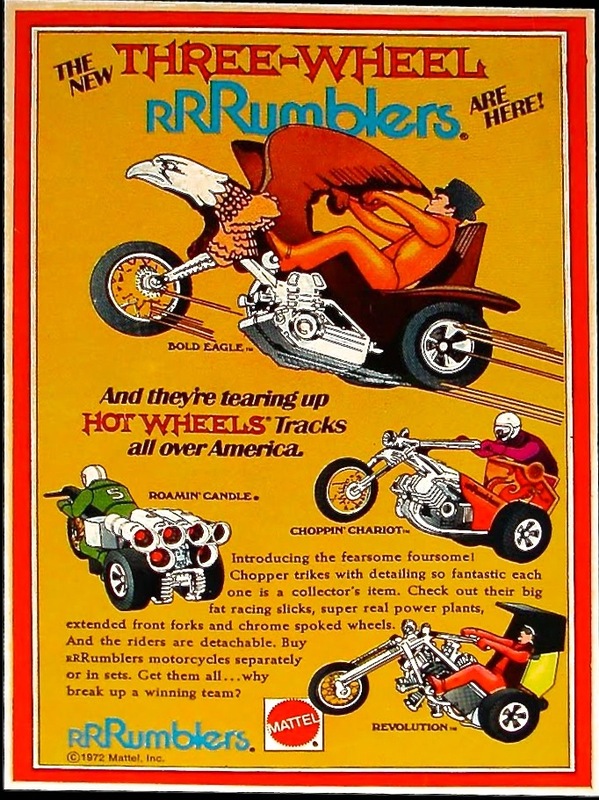 1972 Roamin’ Candle blister card. Courtesy eBay. 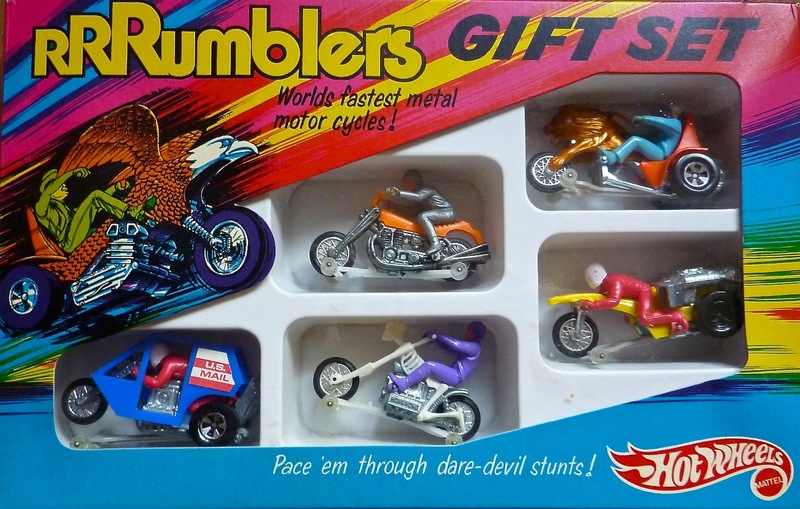 RRRumblers gift set from the U.K. Courtesy eBay. 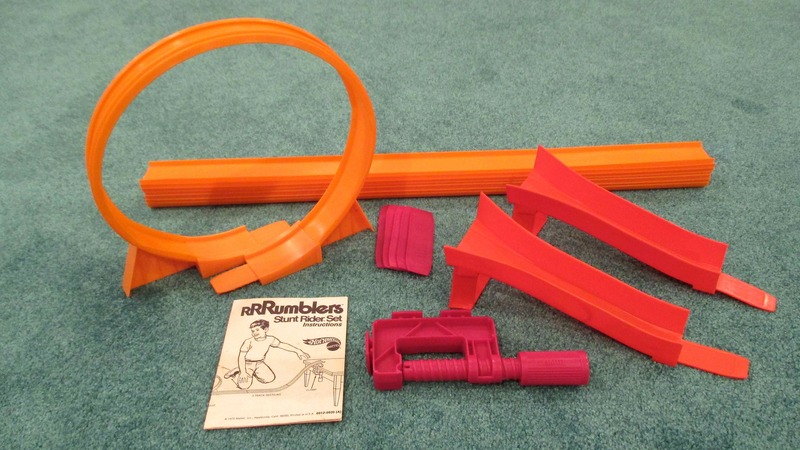 A second RRRumblers gift set from the U.K. Courtesy eBay. 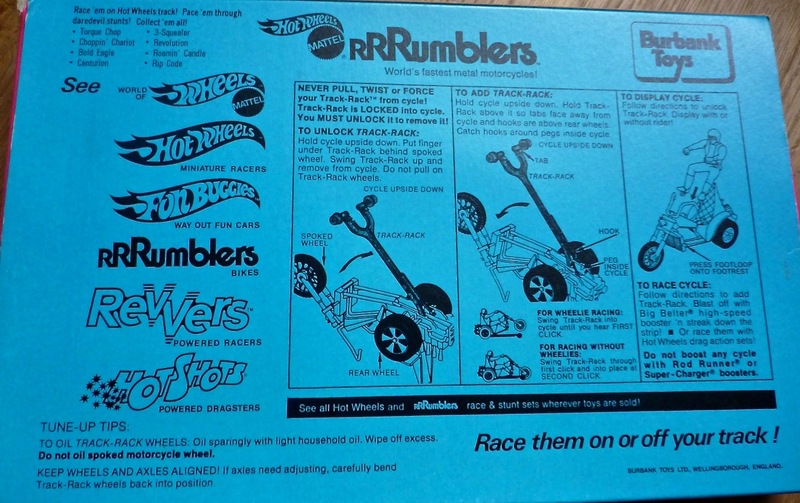 Back of RRRumblers gift set from the U.K. Courtesy eBay. 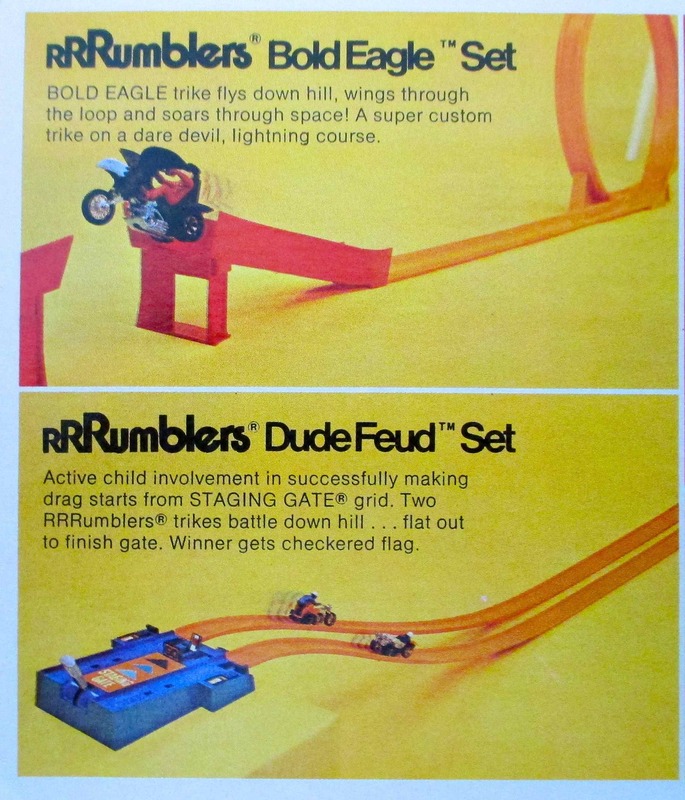 1972 RRRumblers track sets from 1972 Collector’s catalogue. 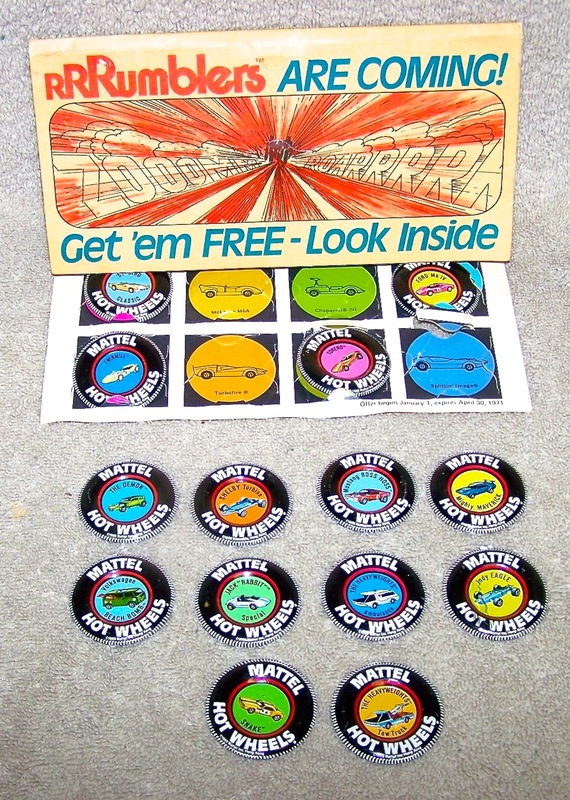 Copyright Mattel, Inc.